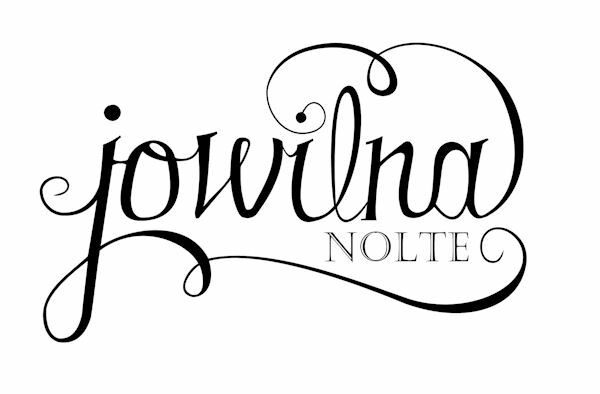 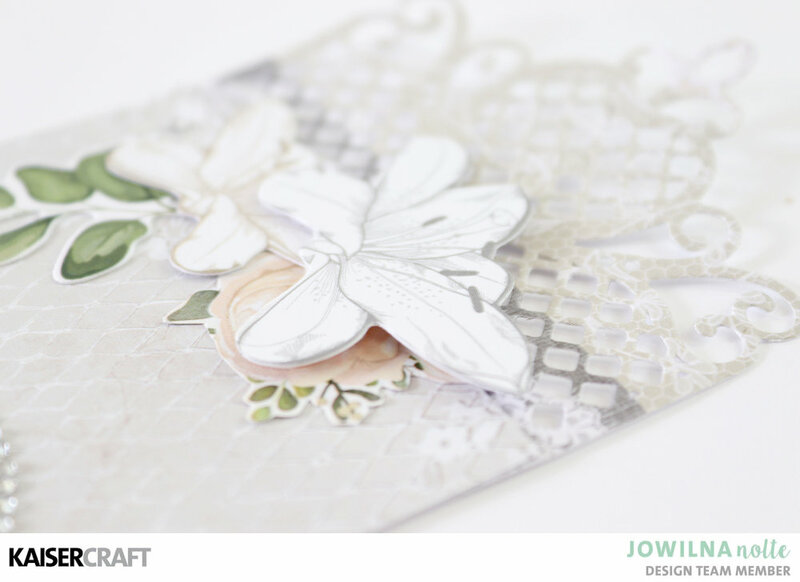 Welcome to today’s blog post with me Jowilna. 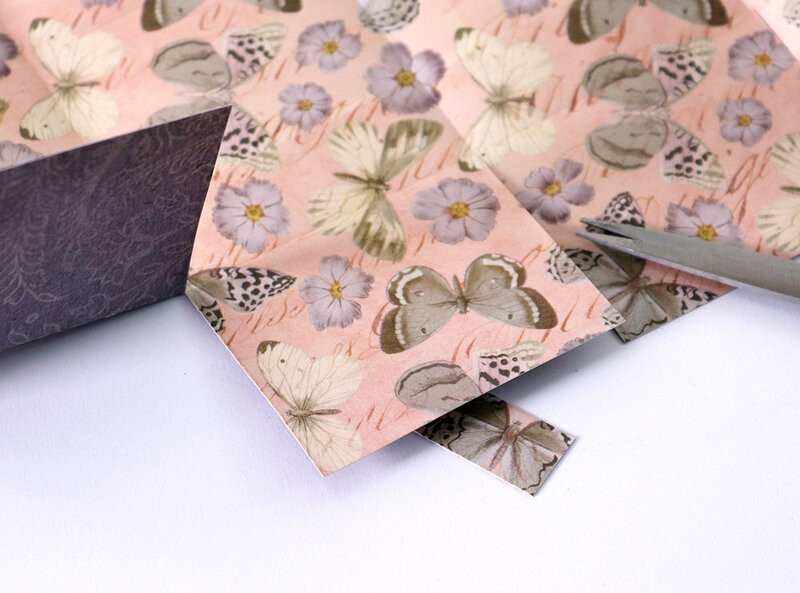 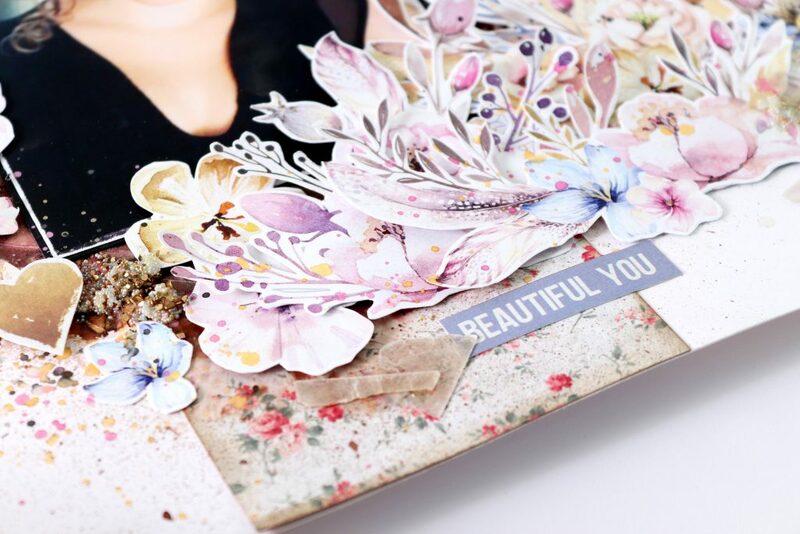 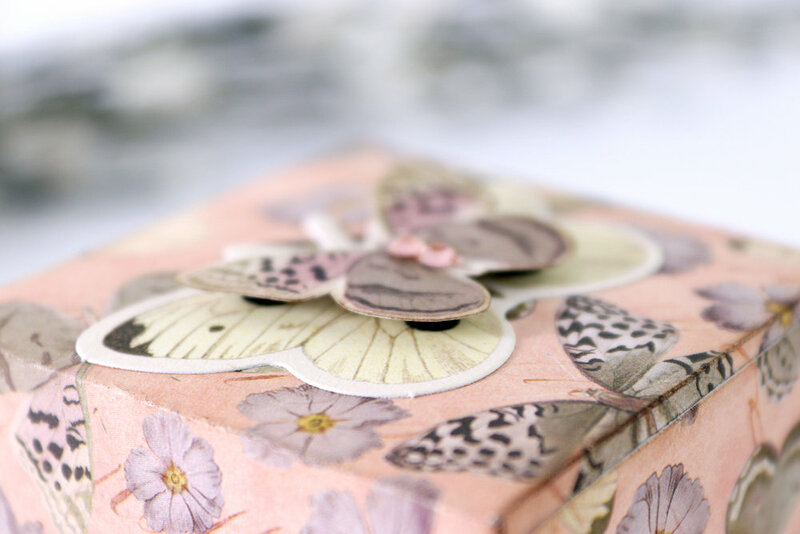 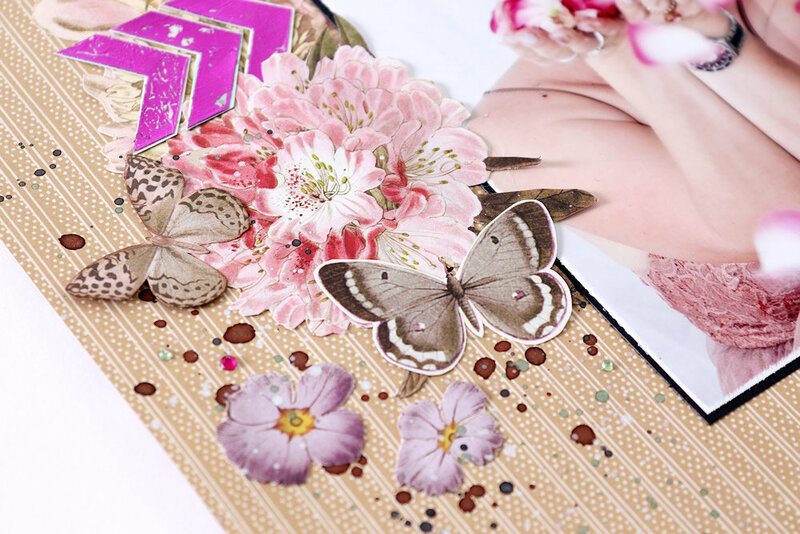 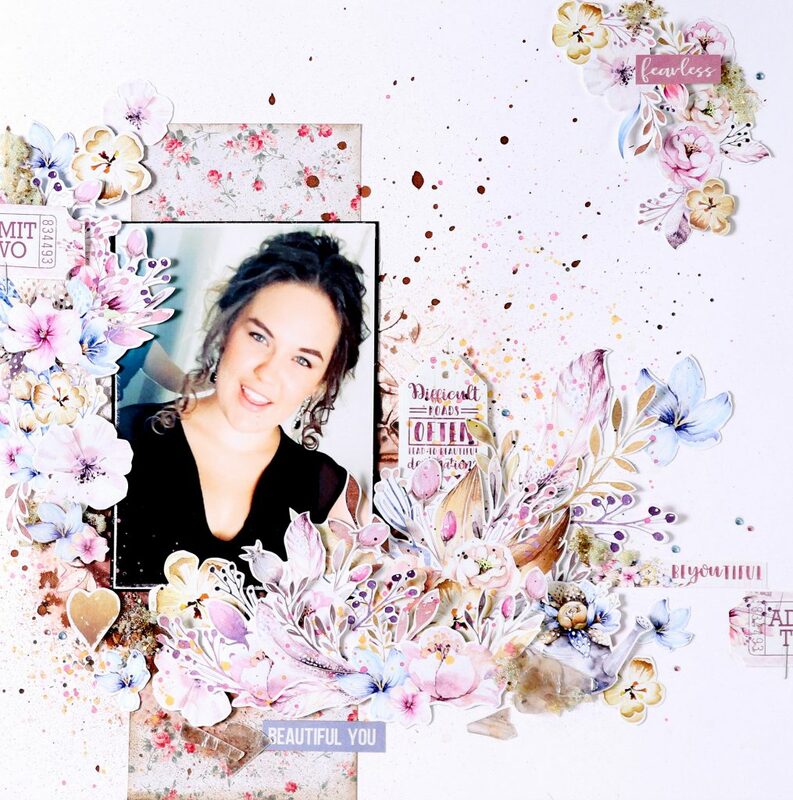 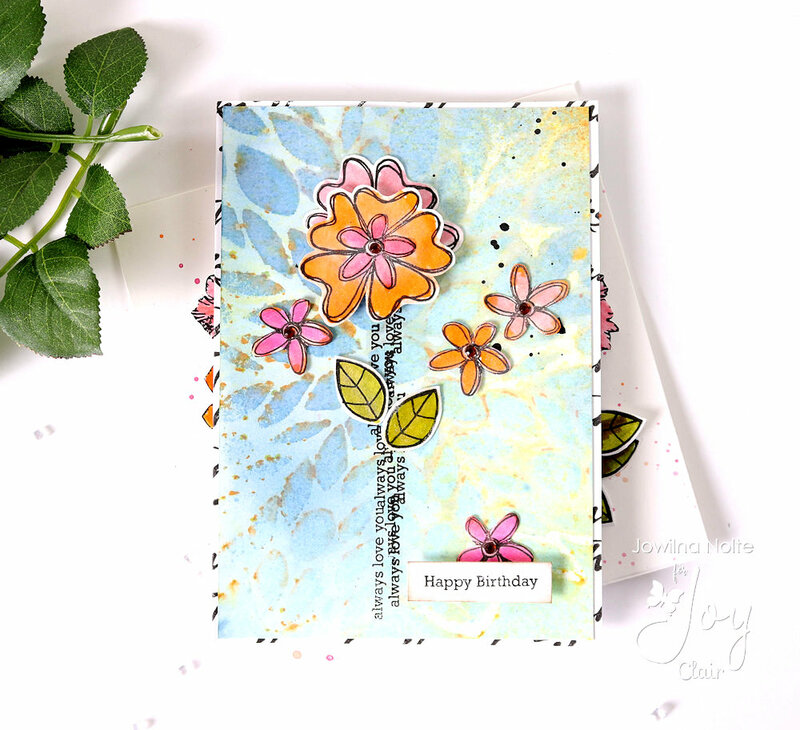 I am sharing a single page layout with you today using the Butterfly Garden Collection, with an interesting twist using hot foil. 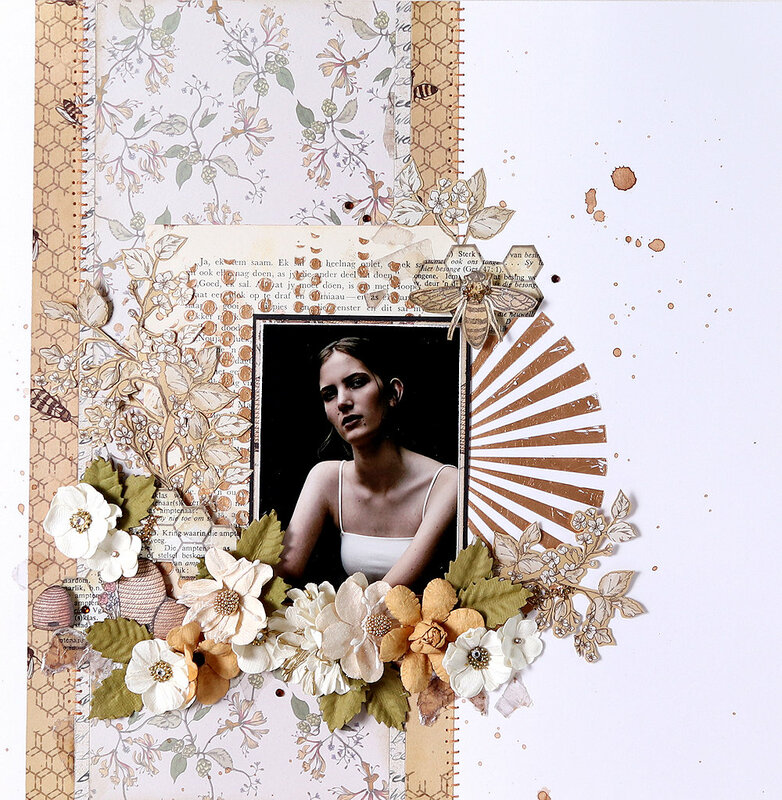 For my layout background I switched my traditional white background for this golden caramel coloured stripe. 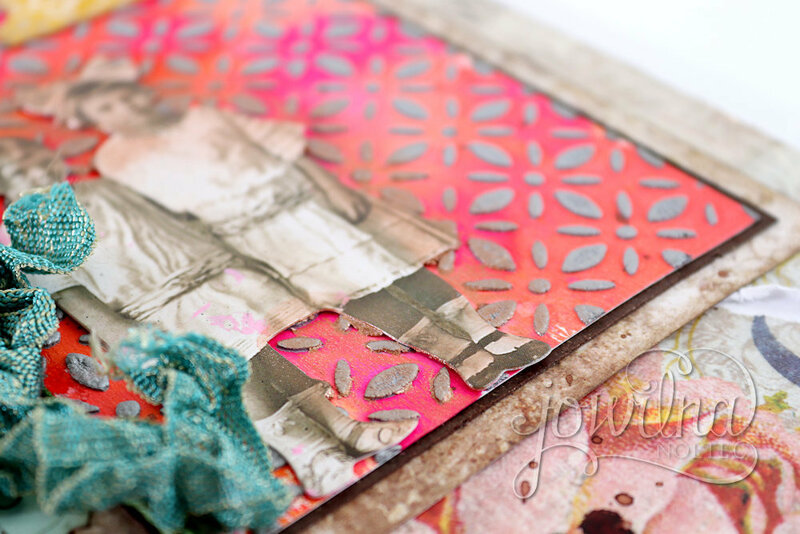 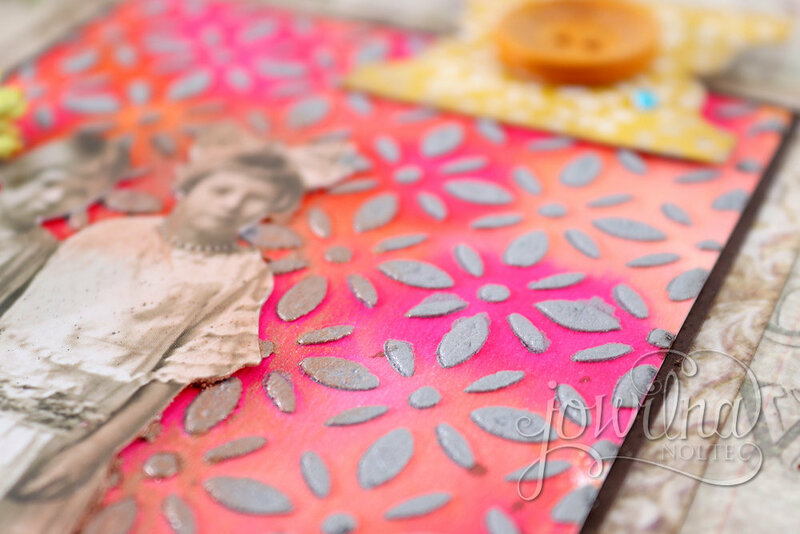 To add interest I used my oink mirror foil to create some striking elements for my page. 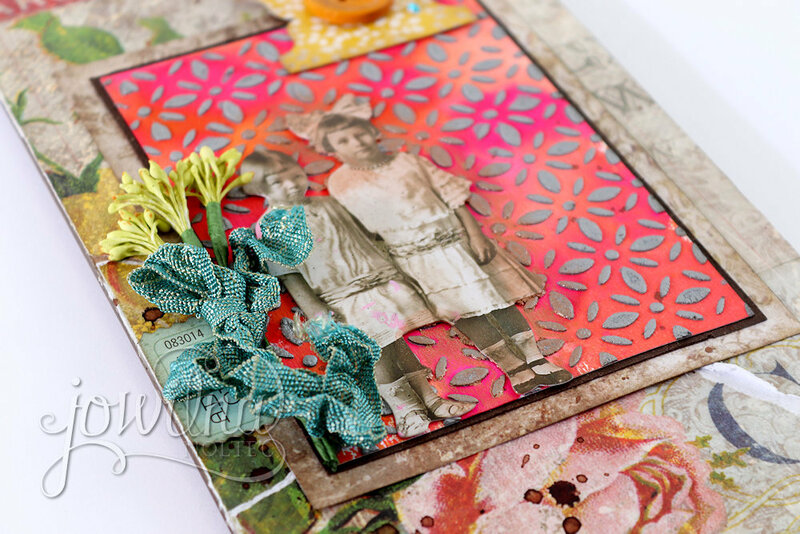 There’s a number of ways you can achieve this look. 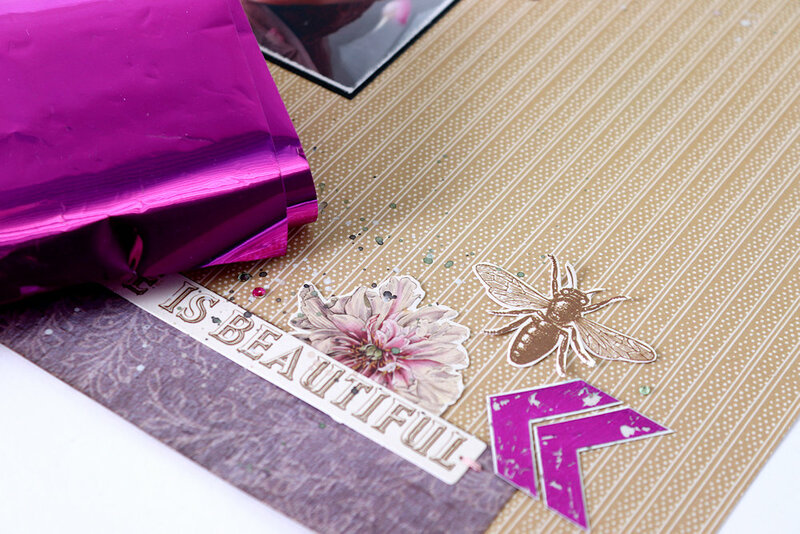 I love how the foil picks up on the pink and purple in the paper but also adds an unexpected element of surprise because of its bold colour and shine – just as bold and gorgeous as my friend in the photo. 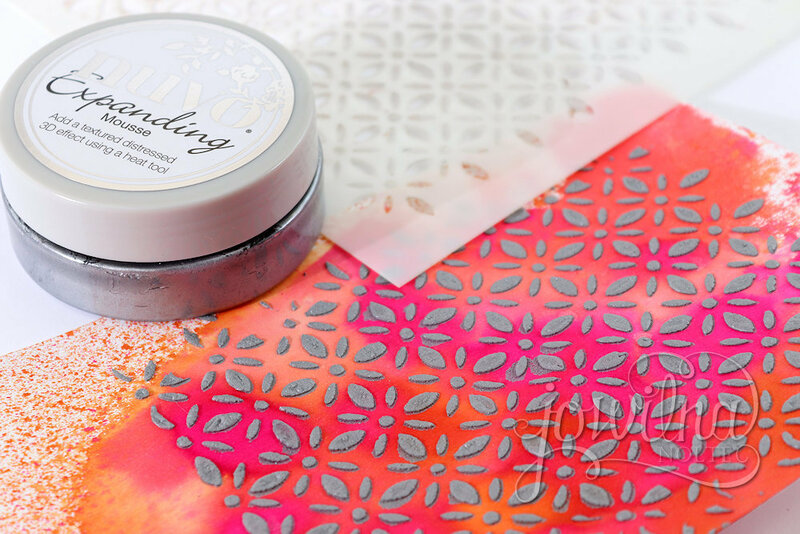 I apply gel medium through my stencil and left it to dry, once the gel easy just tacky I added my foil to the gel and rubbed it off using my boned folder. 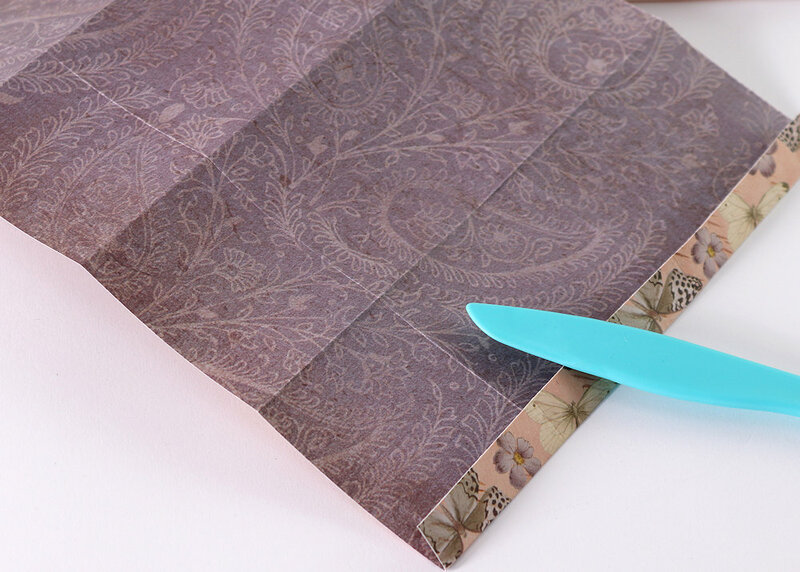 Then quickly peel off the sheet of foil to reveal this stunning effect. 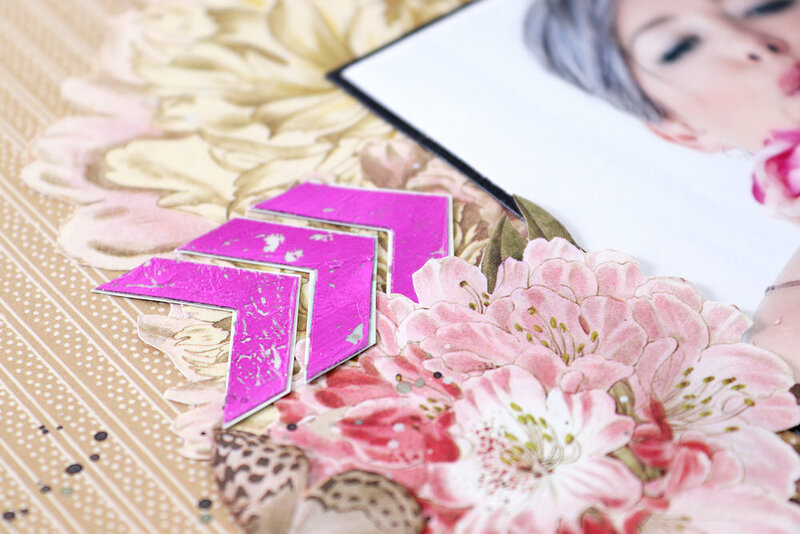 I cut the chevron pieces up to separate them and then added them to my layout. 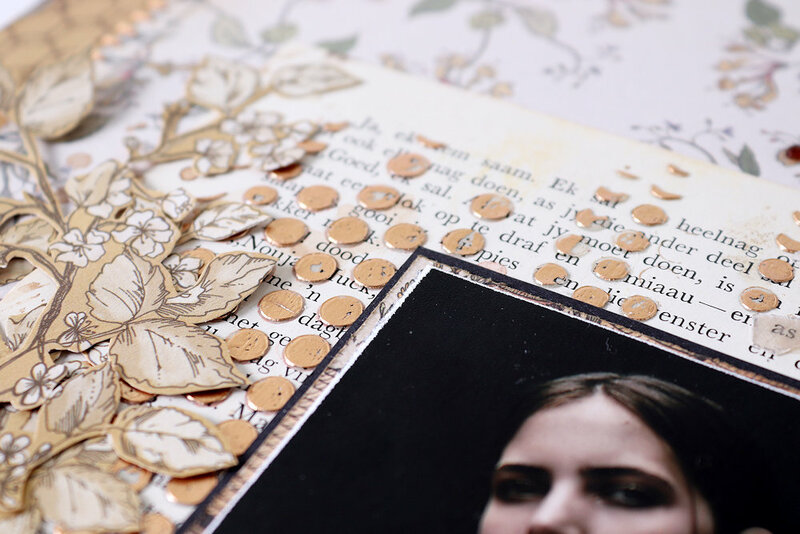 Secondly I added some ephemera bits from my pack. 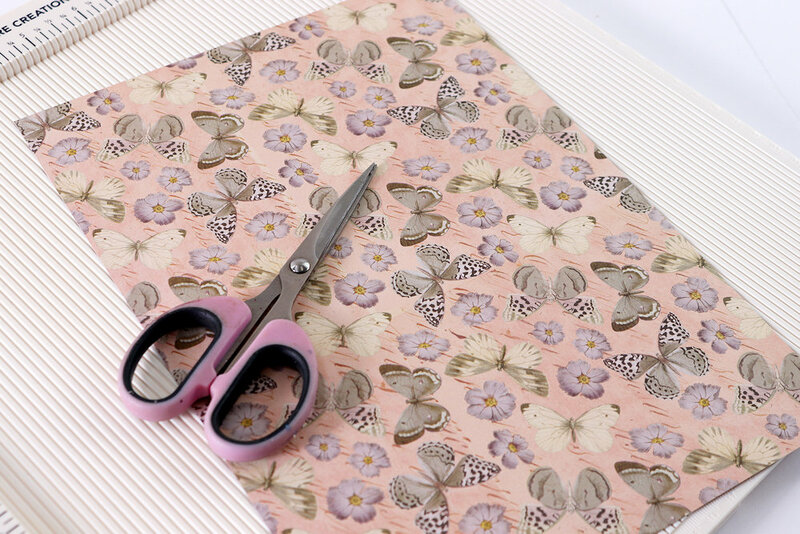 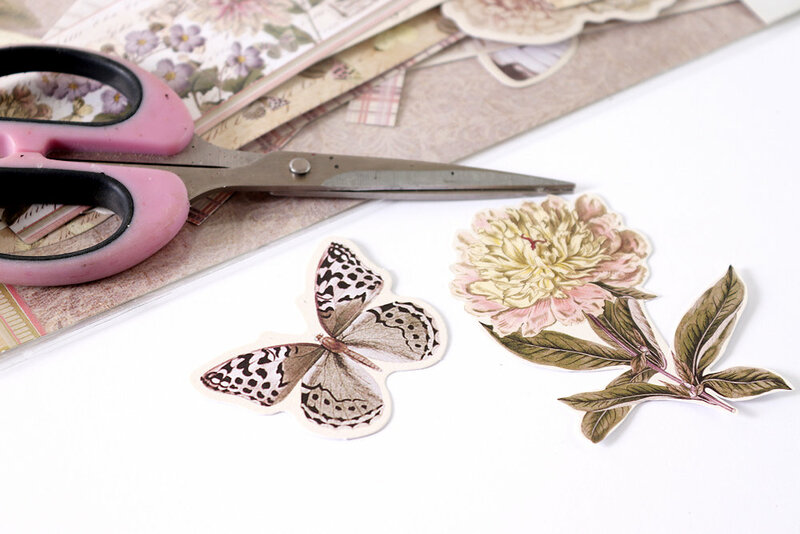 I simply use my scissors to trim the excess white around the elements smaller, almost like fussy cutting them. 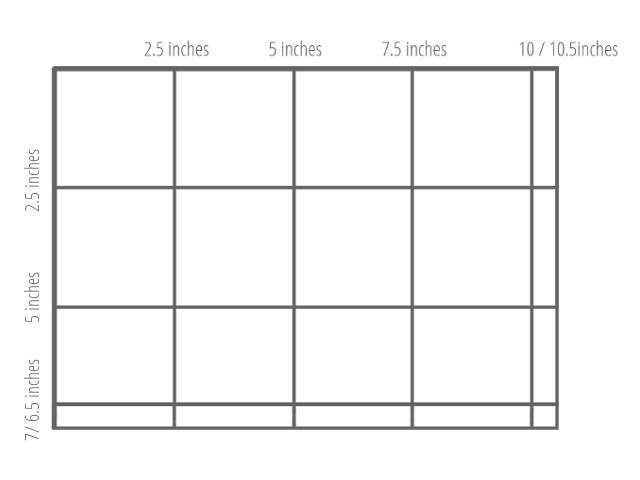 This makes for a much neater and nicer looking element. 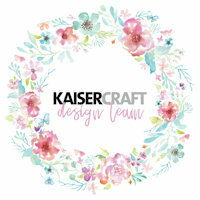 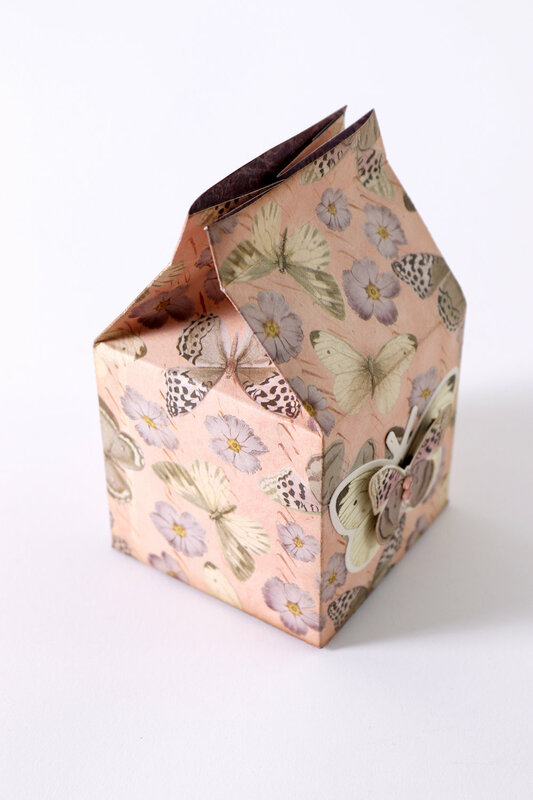 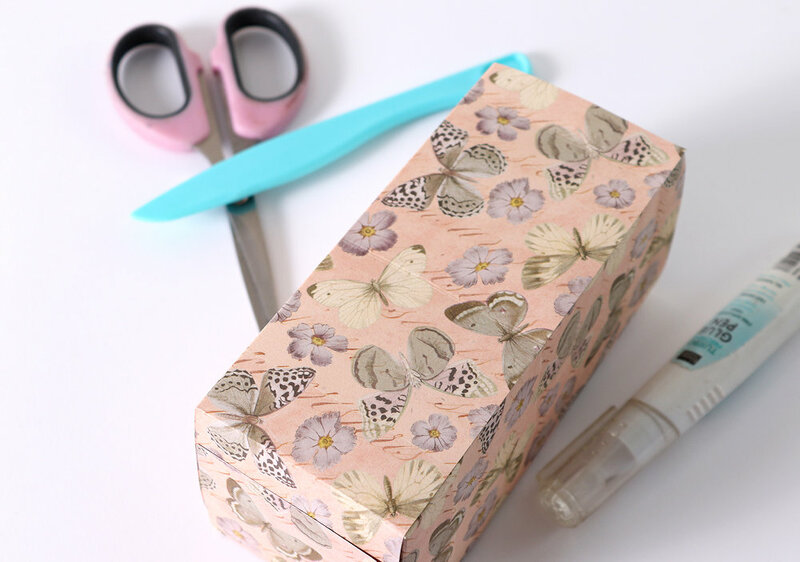 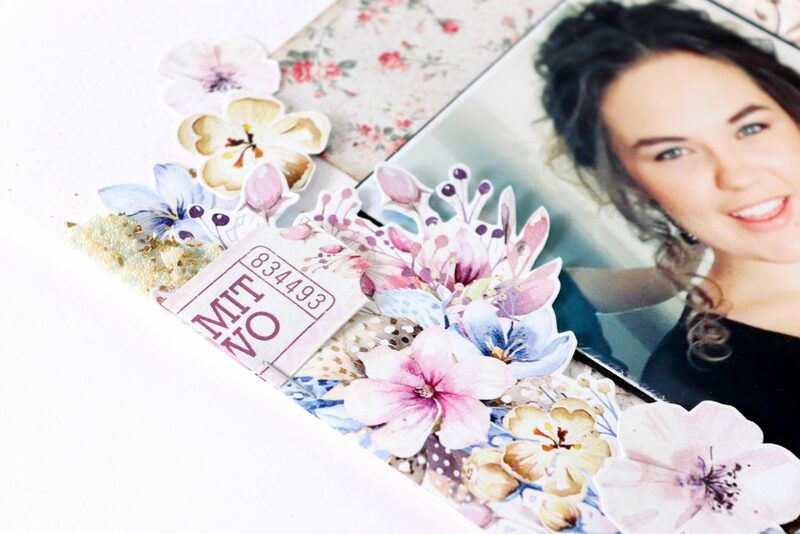 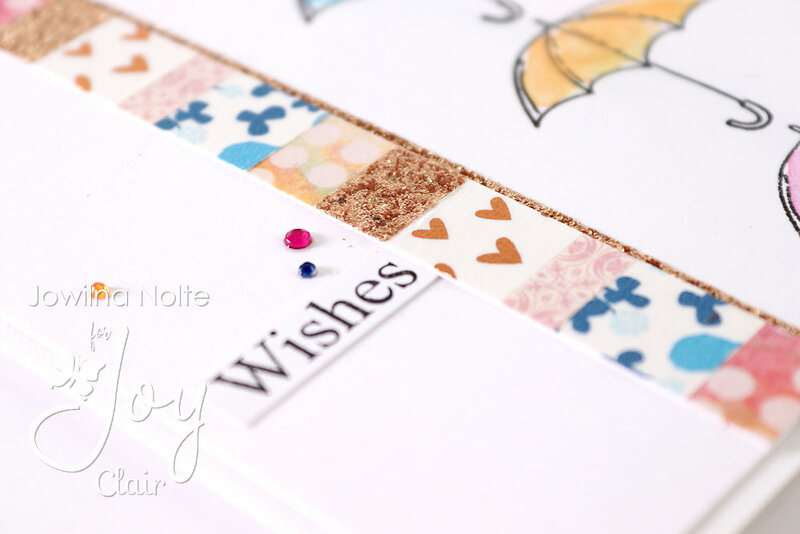 And in a few easy steps I created a layout I love with this stunning range and a few clever ways of using my stash. 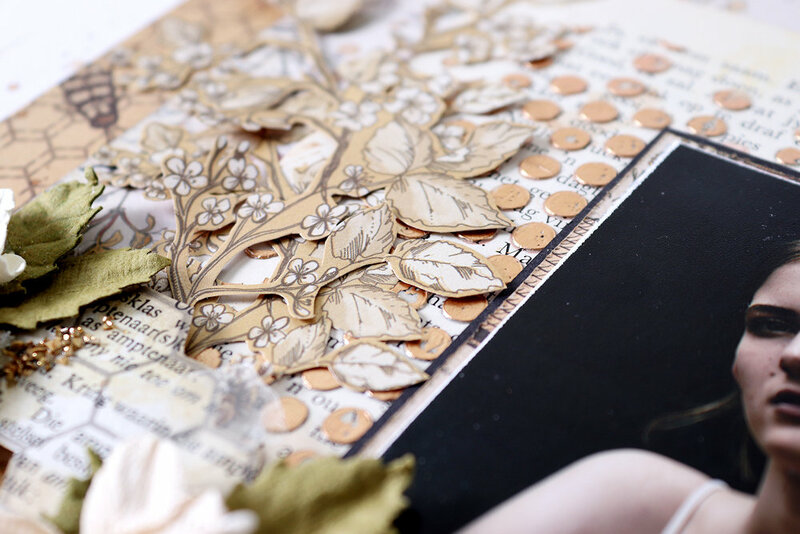 Until next time – live creatively. 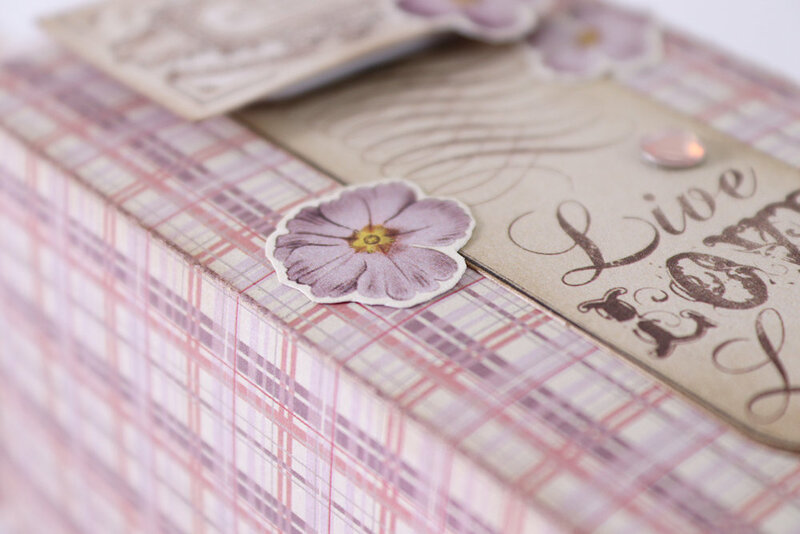 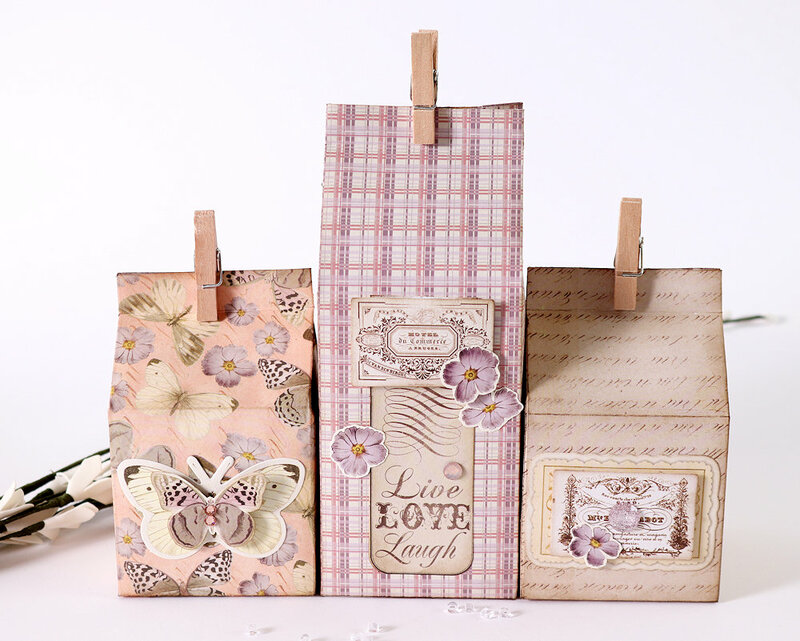 I am absolutely in love with this gorgeous range of papers. 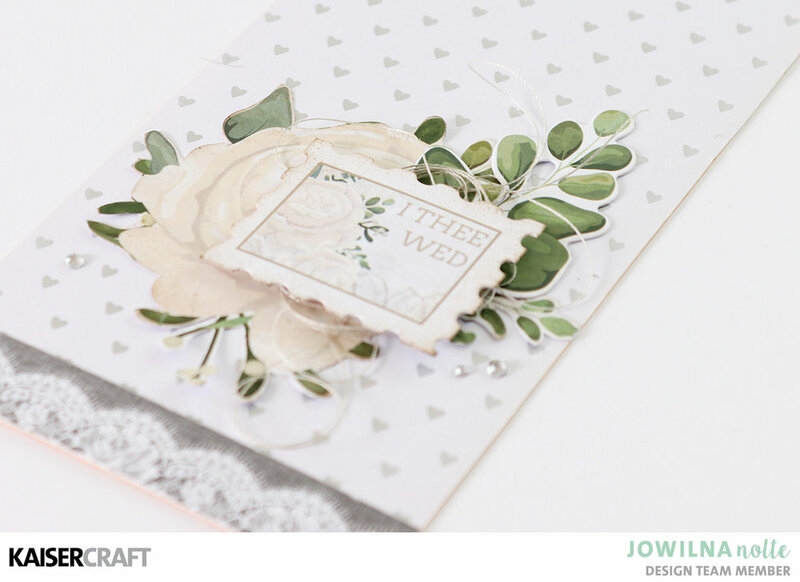 I wanted to create a beautiful layout of my niece and these papers were just perfect. 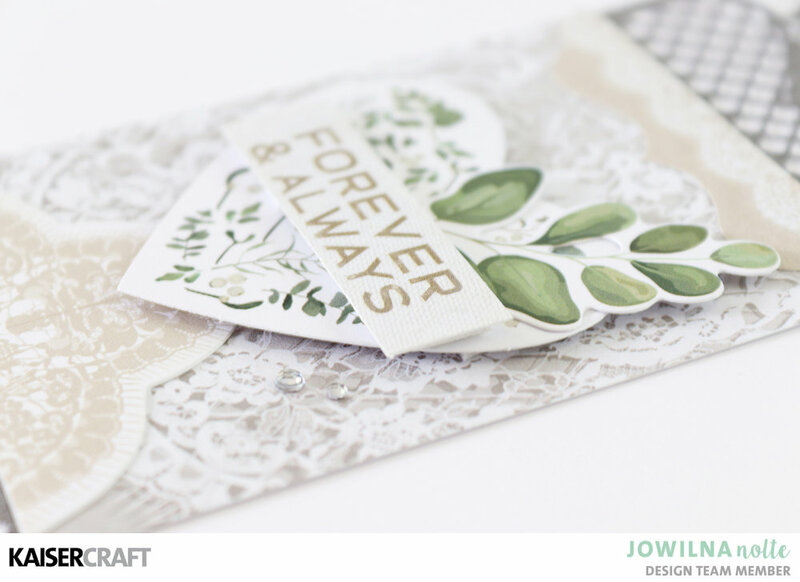 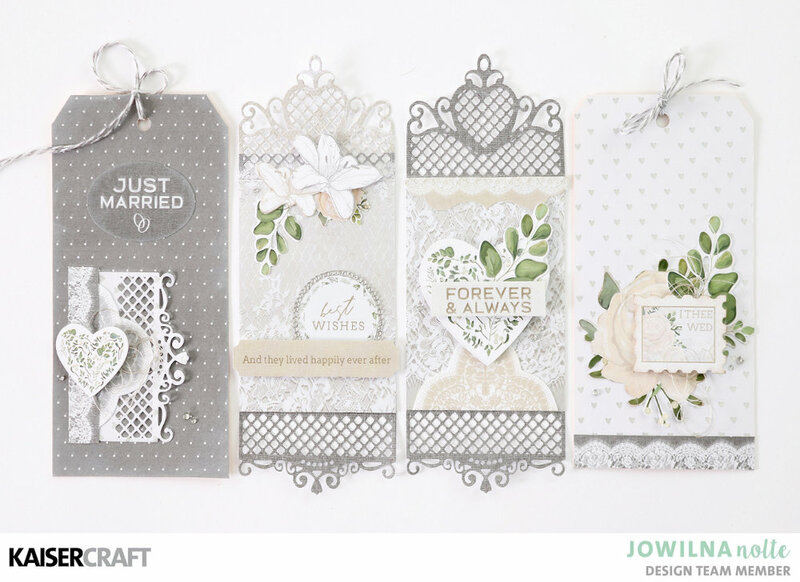 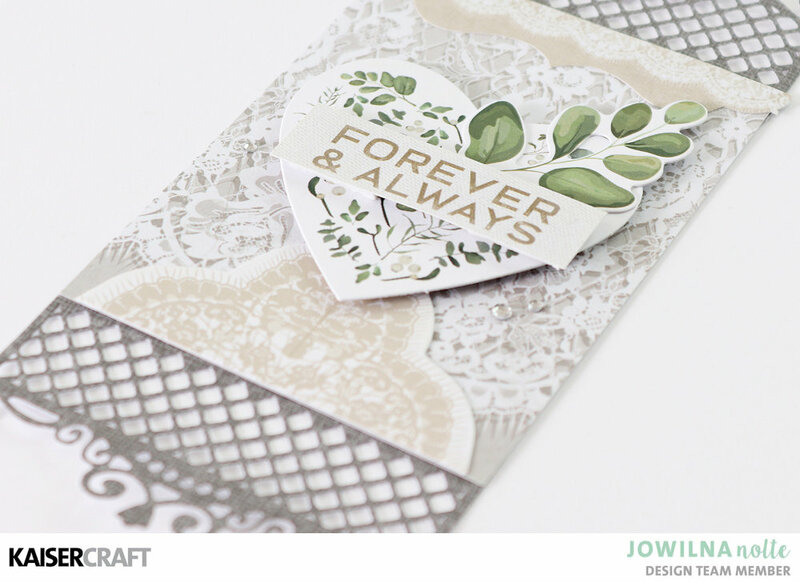 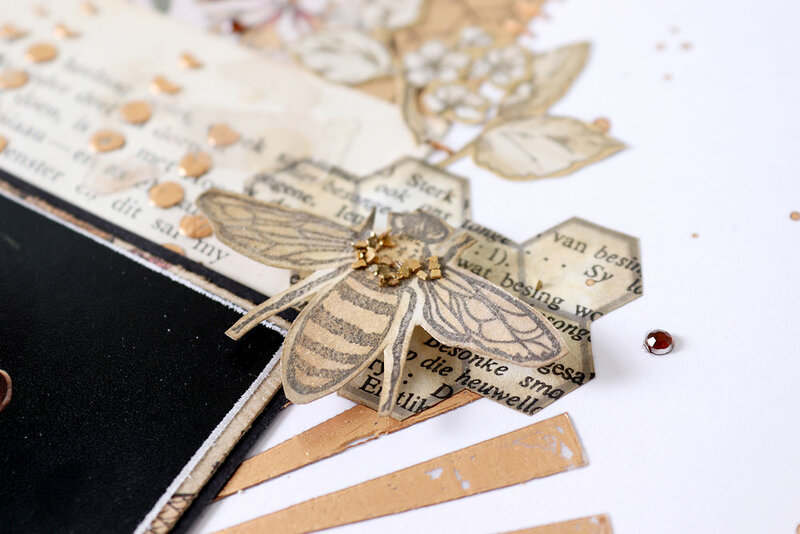 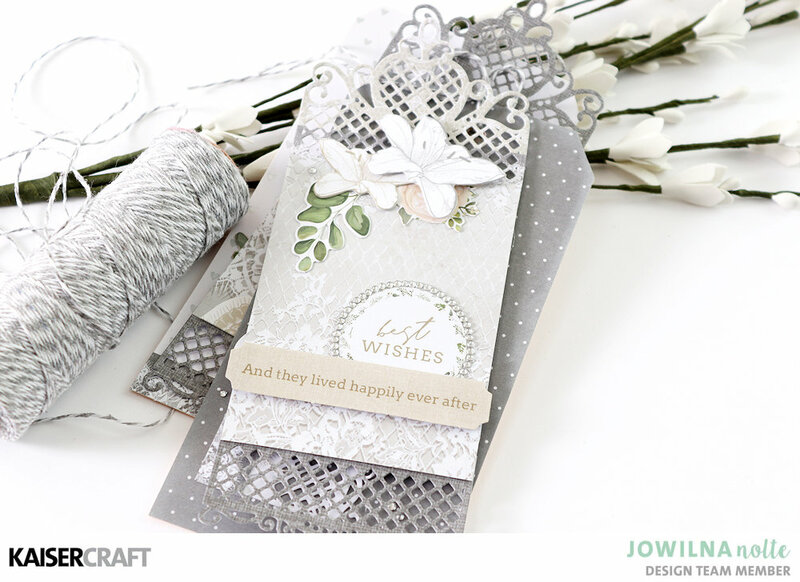 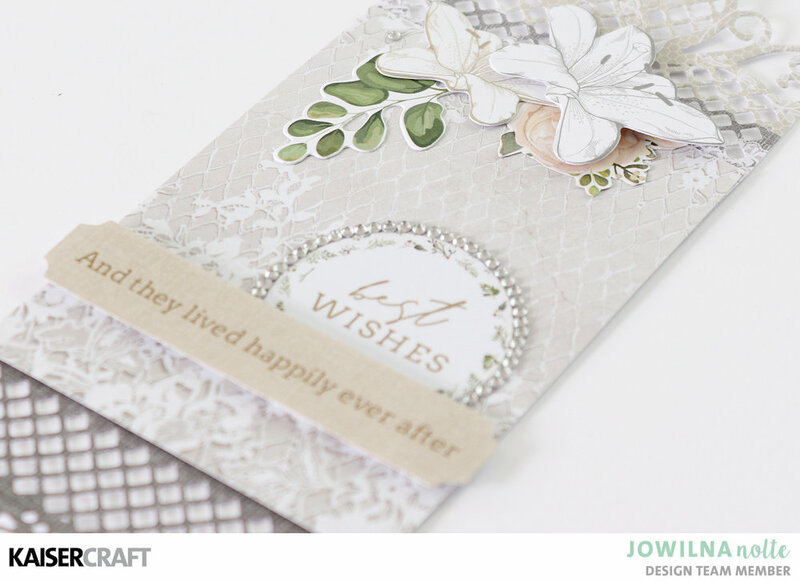 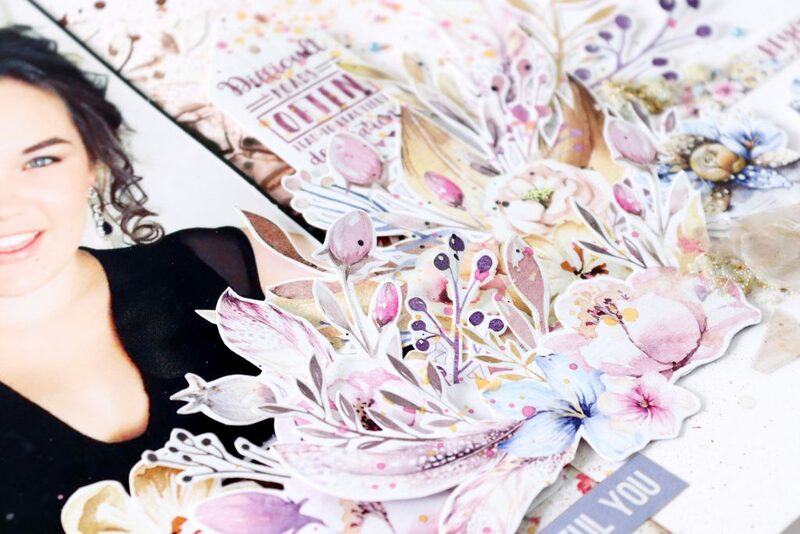 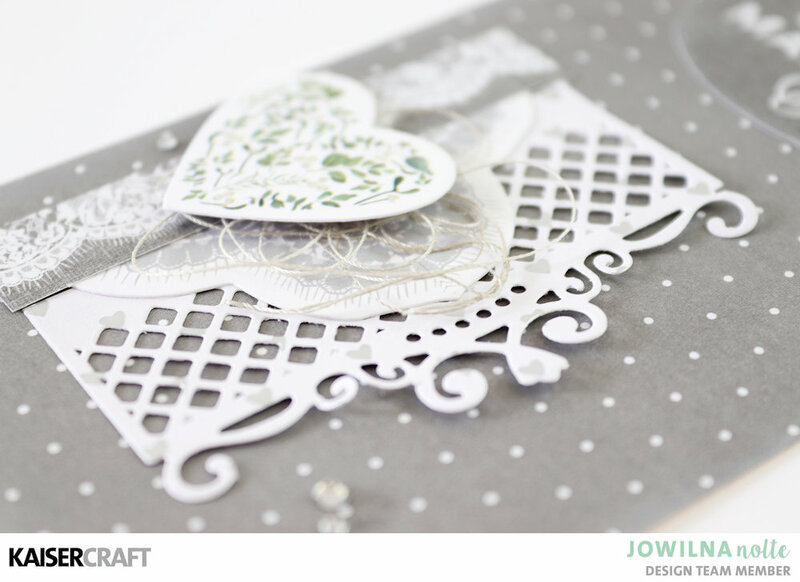 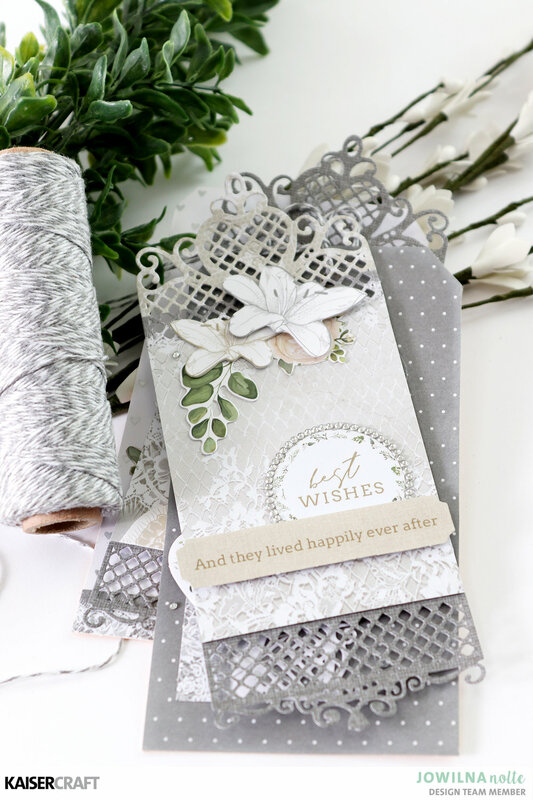 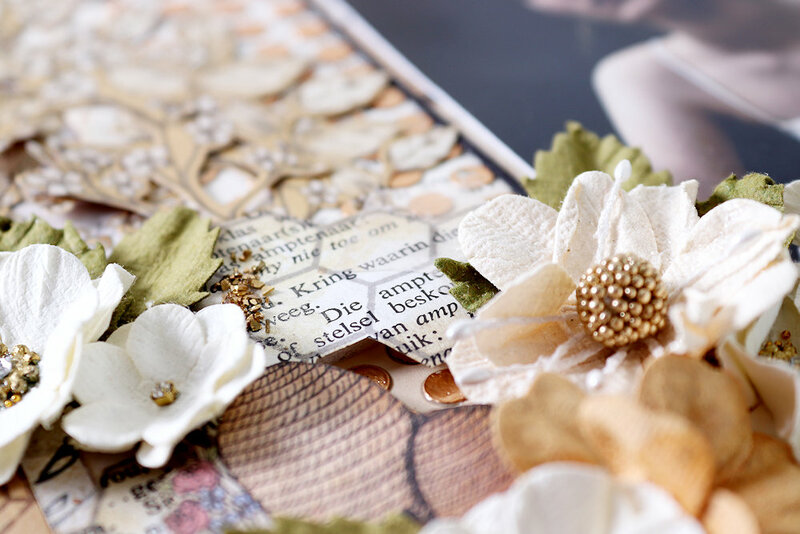 I loved the fussy cut sheet to cut out all the elements from and to create clusters of layered elements. 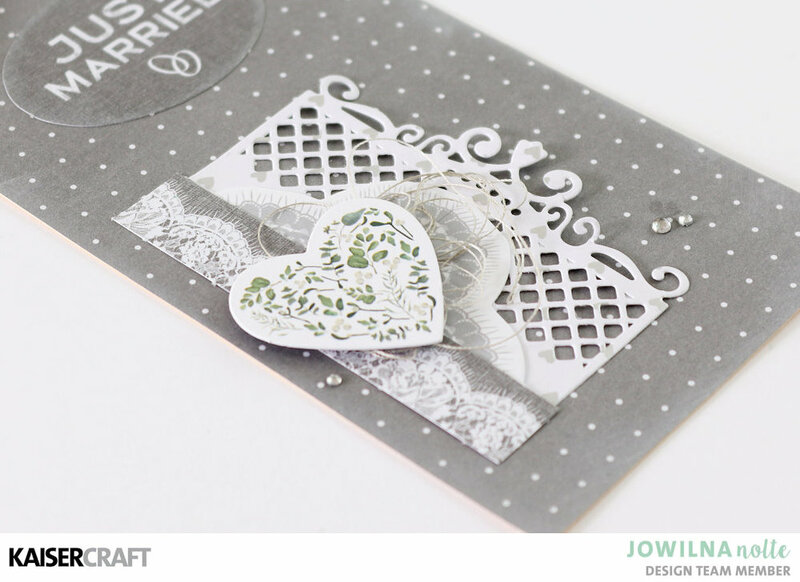 As much as I love this paper range, I also love the element of surprise and so I added a strip of Kaisercraft paper into the mix. 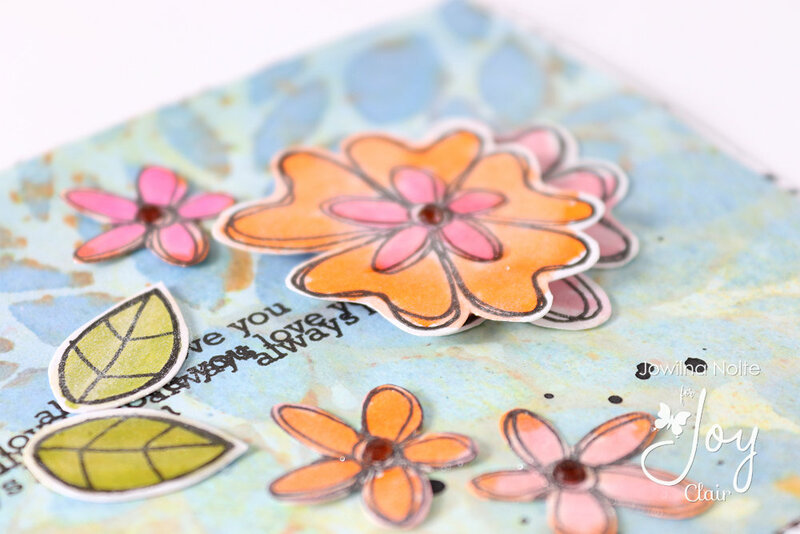 On the background, I added some stencilling with inks for added interest. 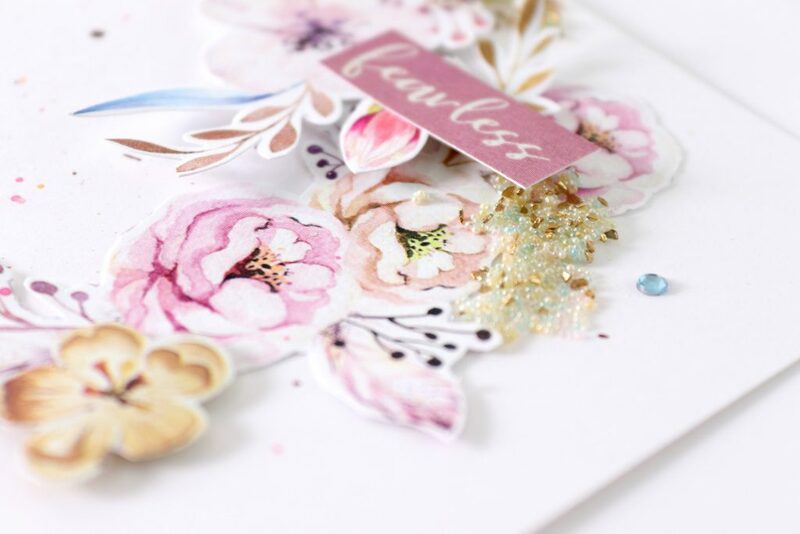 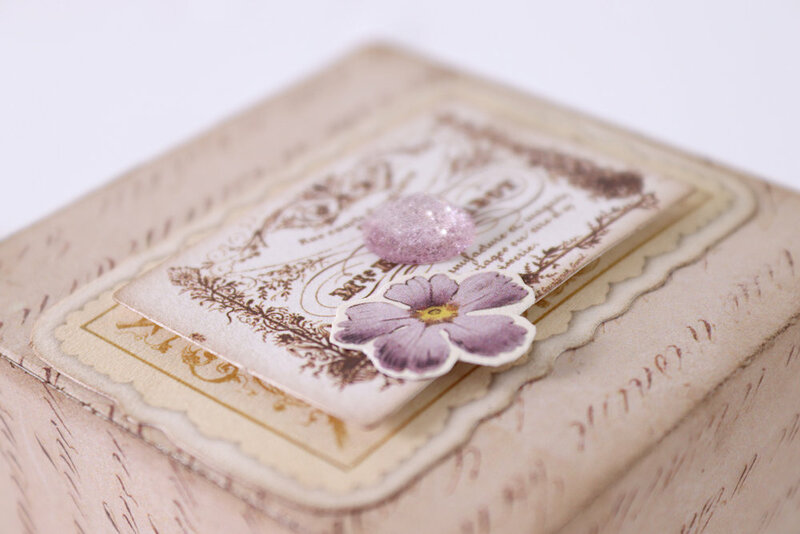 Combined with the papers and cut out elements I used some microbeads, mica and diamante to add dimension and interest in between the beautiful floral elements. 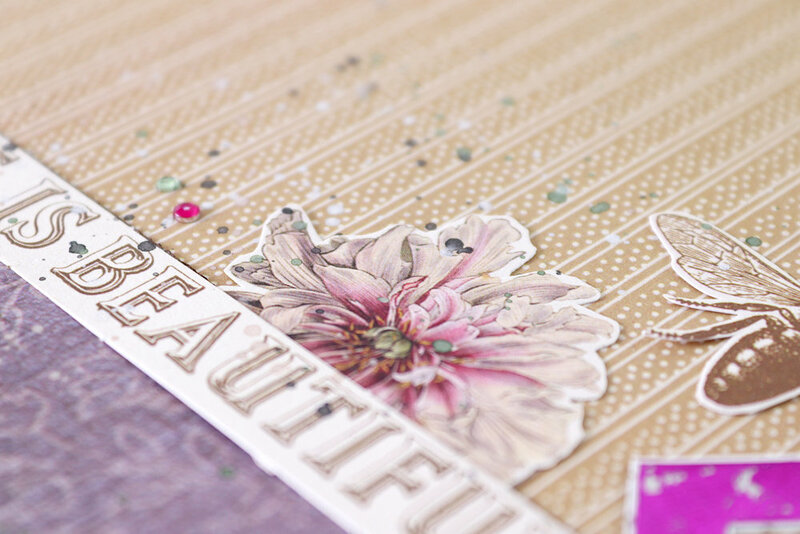 Paint splats across the background in the colours of the papers make for a visually interesting effect. 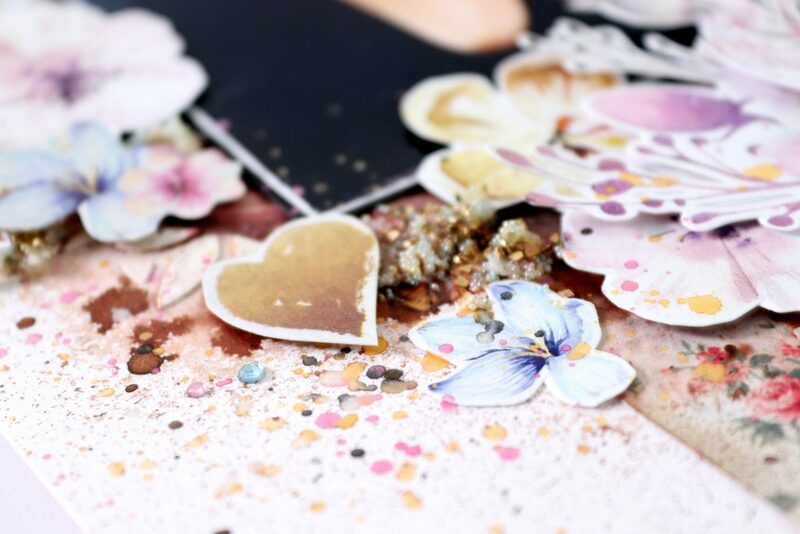 I splat over the entire page design, just covering my photo so that the paint splats also land on top of the cut out flowers adding interest over the entire page. 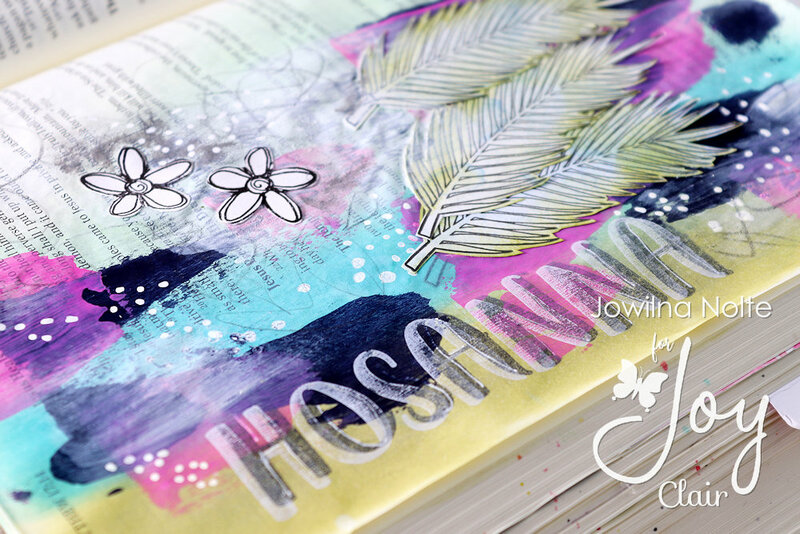 This Holy Week we are celebrating with the stunning range of Color by Faith Stamps available from Joy Clair creating beautiful art work. 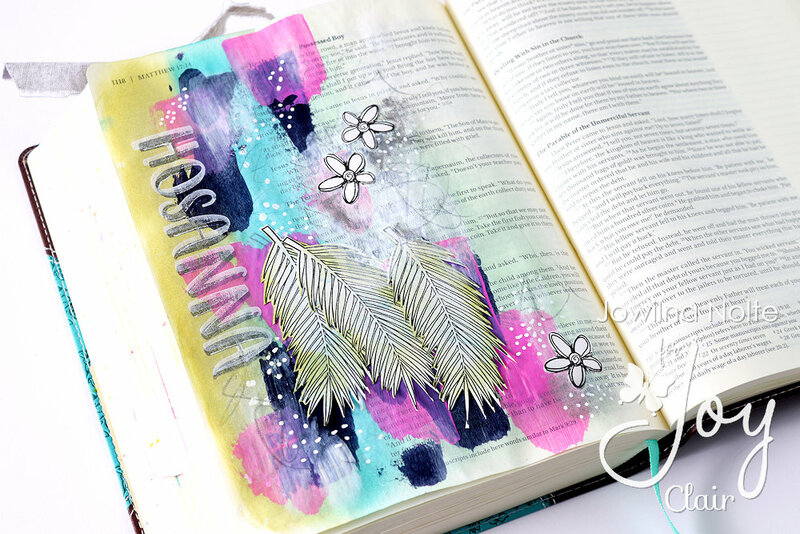 I created this Bible Journaling spread with the Reckless Love stamp set and Hosanna stamp set. 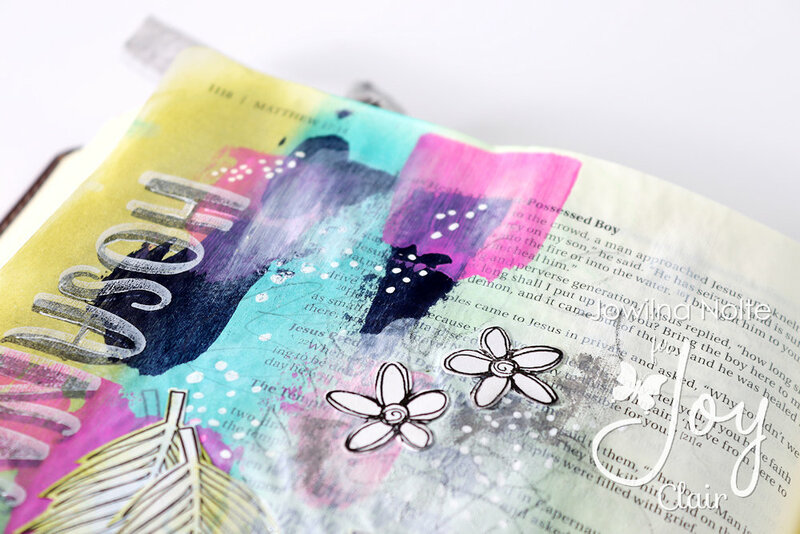 At first I messed up this page so badly, but I took a couple of days to reflect and just pray and rested in the Lord and it came together in the end. 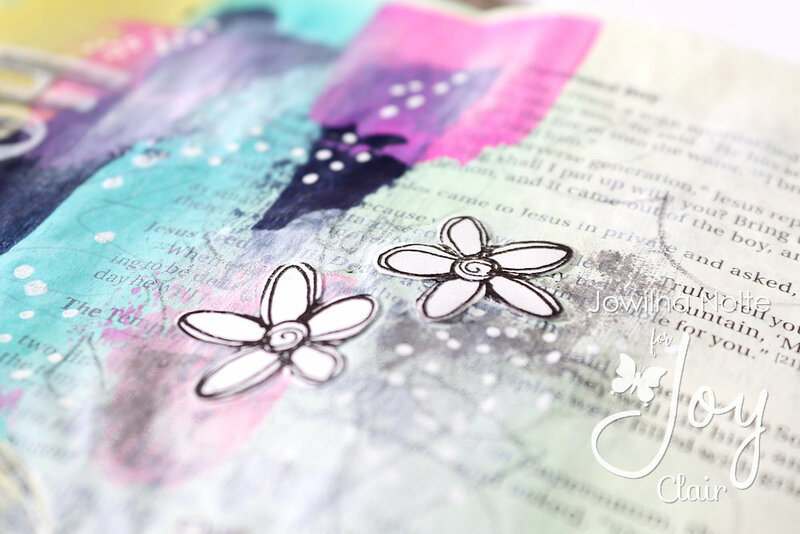 Funny how we try and impress God with perfection when He is just happy with our hearts – after all He knows us much better than the perfection we strive for. 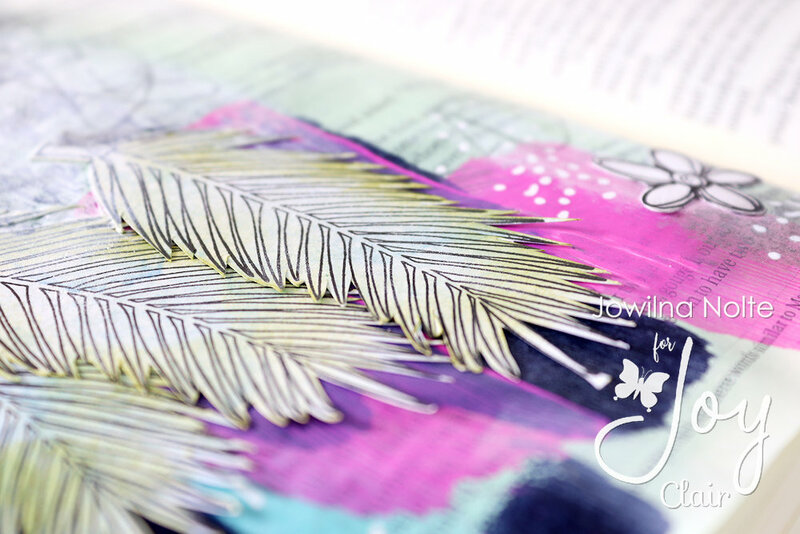 In the New Testament, the word Hosanna appears to be a “special kind of respect” referred to the one who saves. 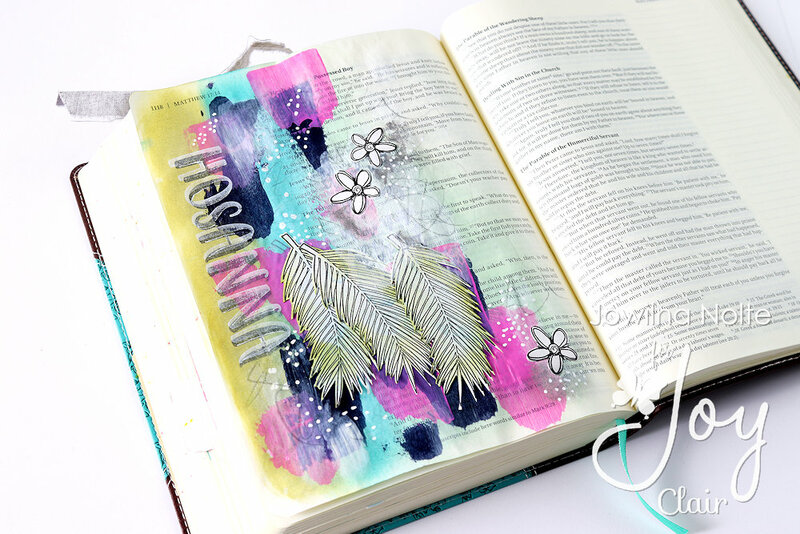 Much like The Lord came and saved this journal page, He saves us daily from sin and imperfection – if only we call on Him. 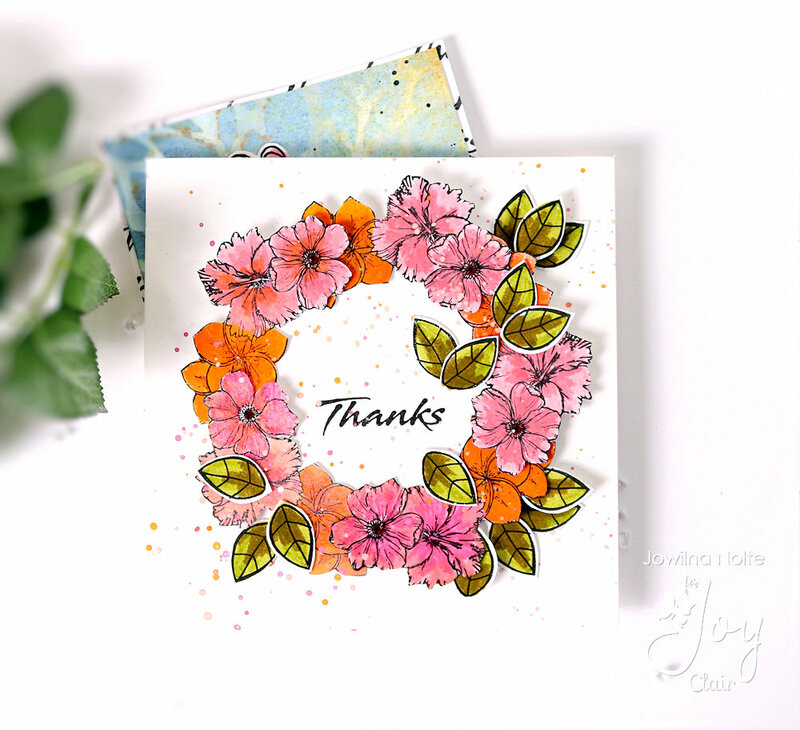 and offered me the perfect opportunity to add a shadow of white StazOn Pigment over it slightly off-set for a stunning end result. 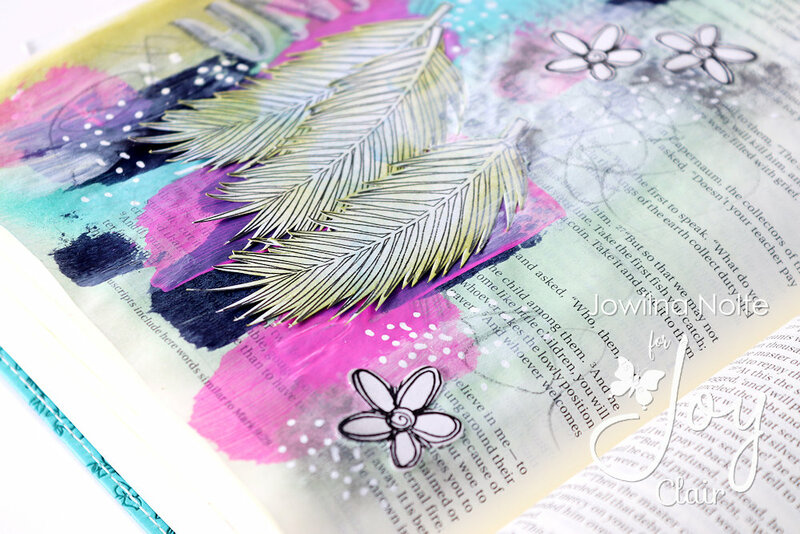 I started off with layered of inking and paint on my background. 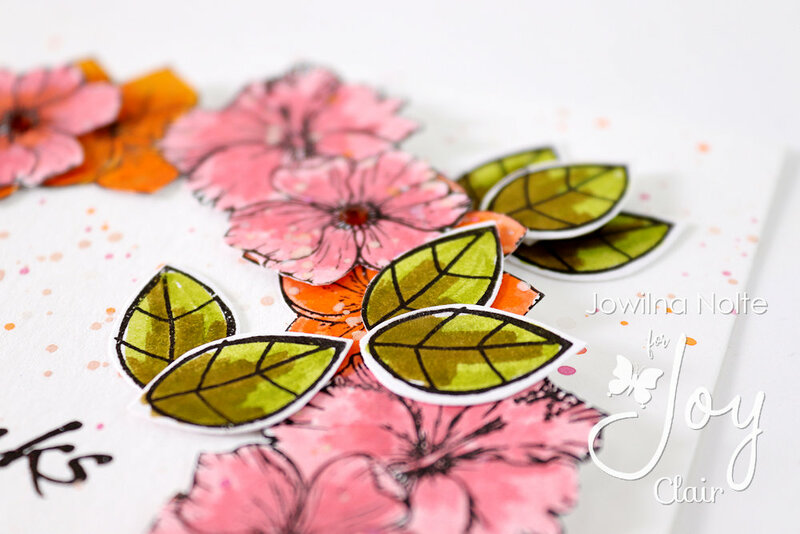 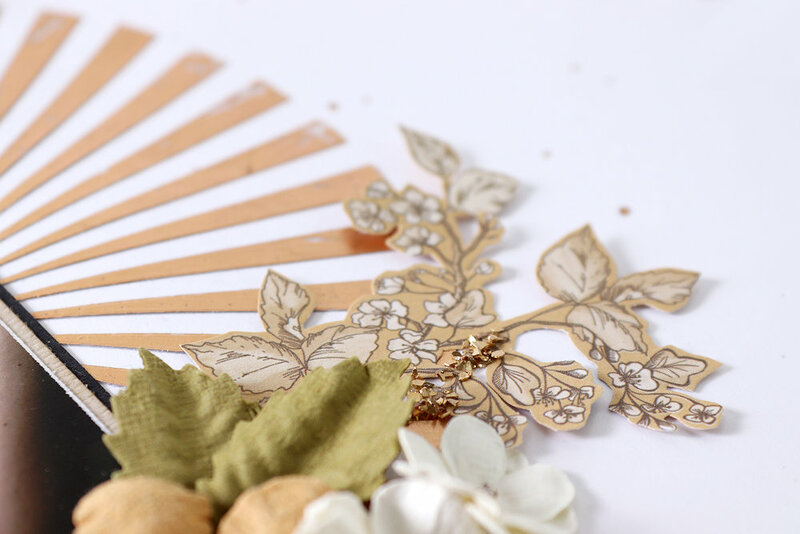 Stamped leaves and flowers onto cardstock and cut them out. 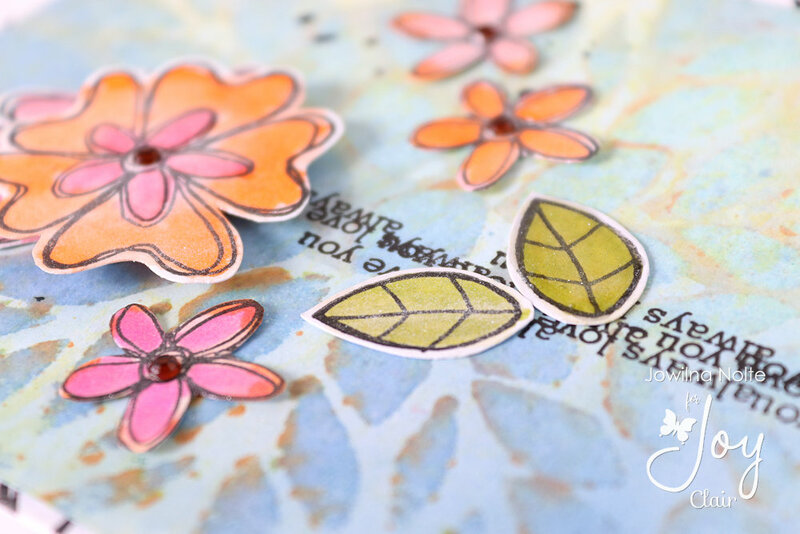 A light inking on the leaves in green adds colour, but it is the white flowers that really pops against the colourful background that I love. 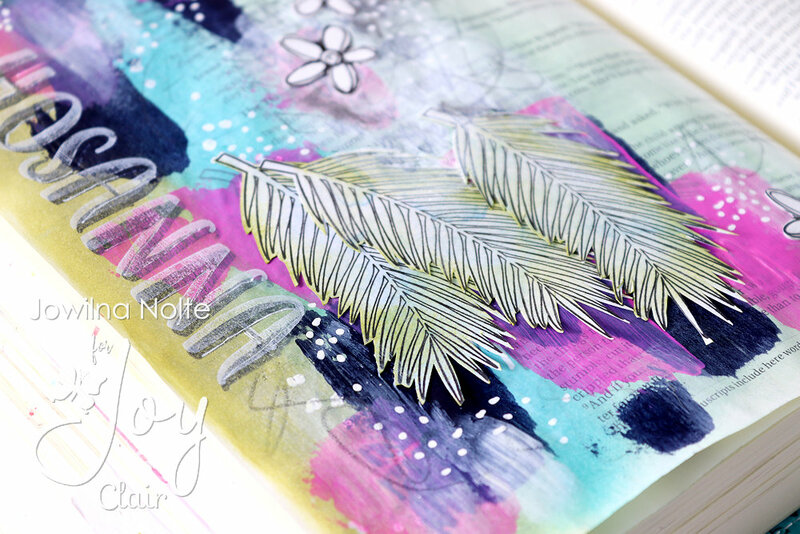 A few white paint pen dots and graphite scribbles finishes off this page. 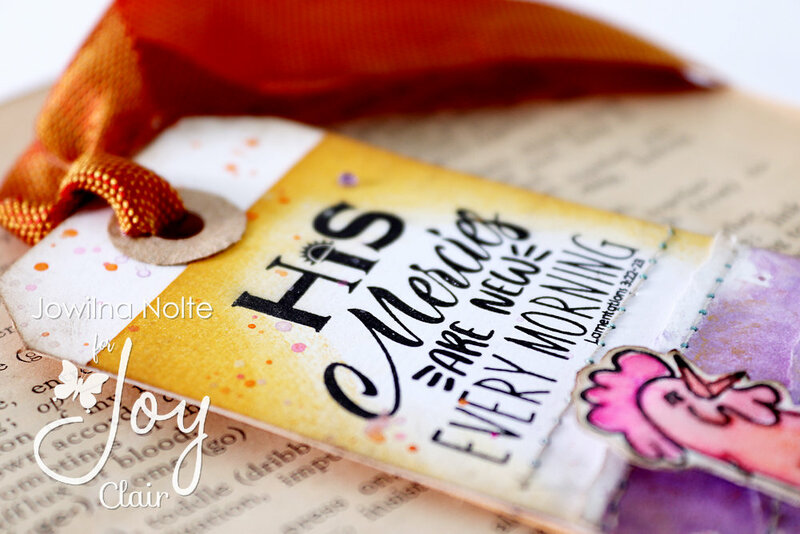 Until next time – Hosanna to the King! 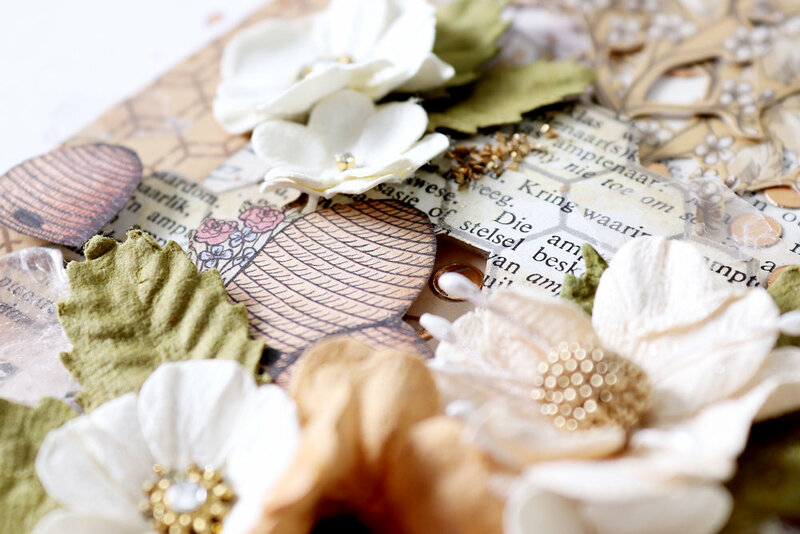 Wishing you a blessed Easter, peace and love. 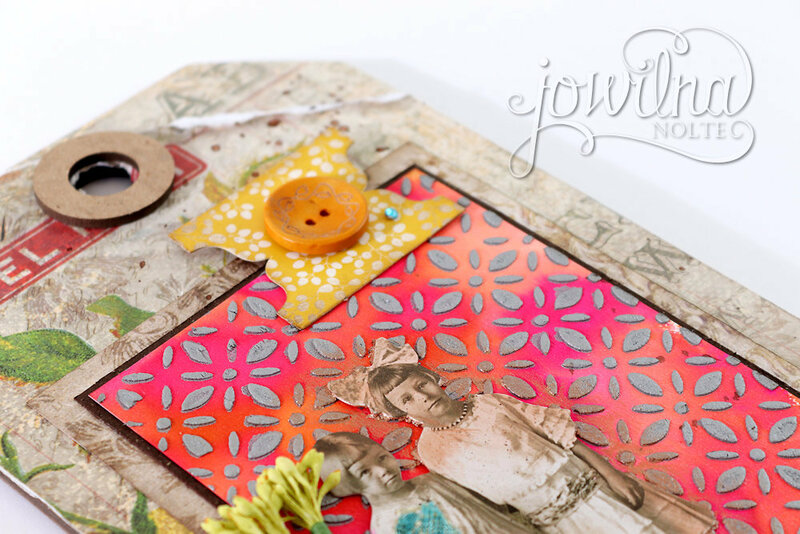 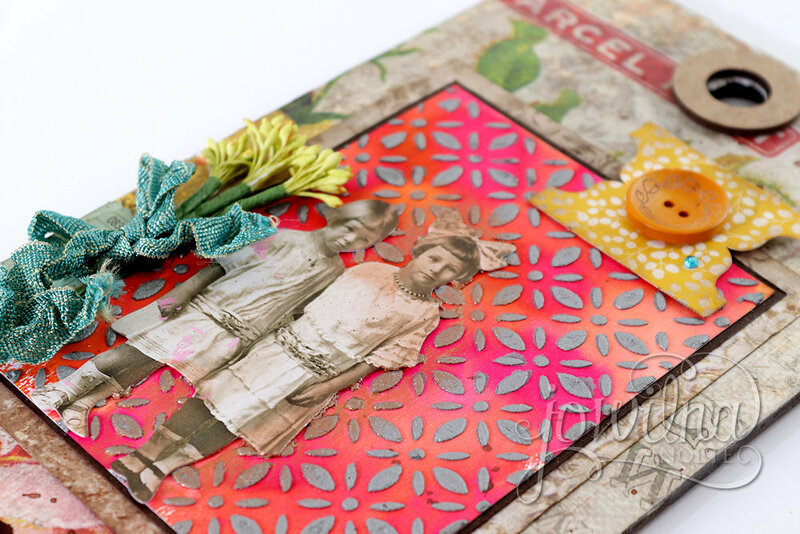 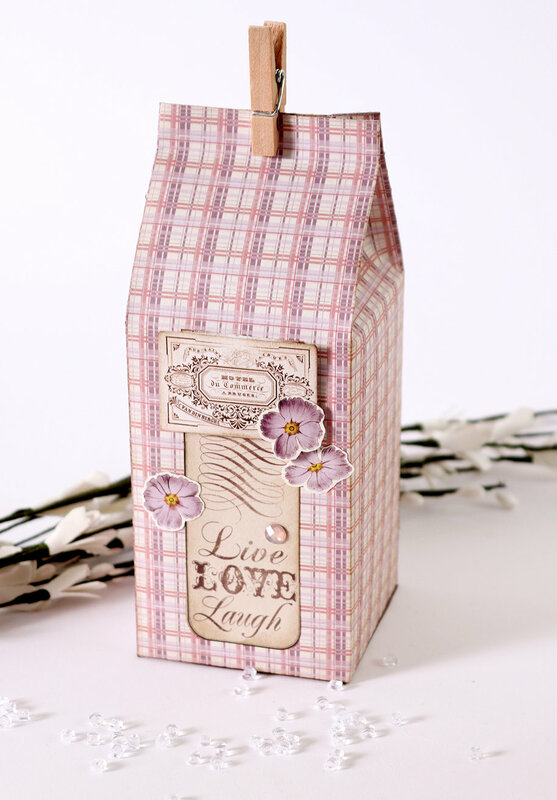 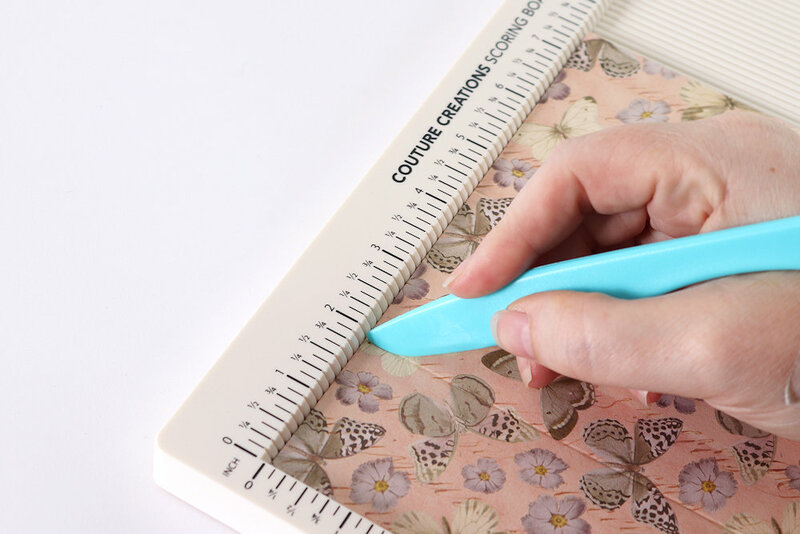 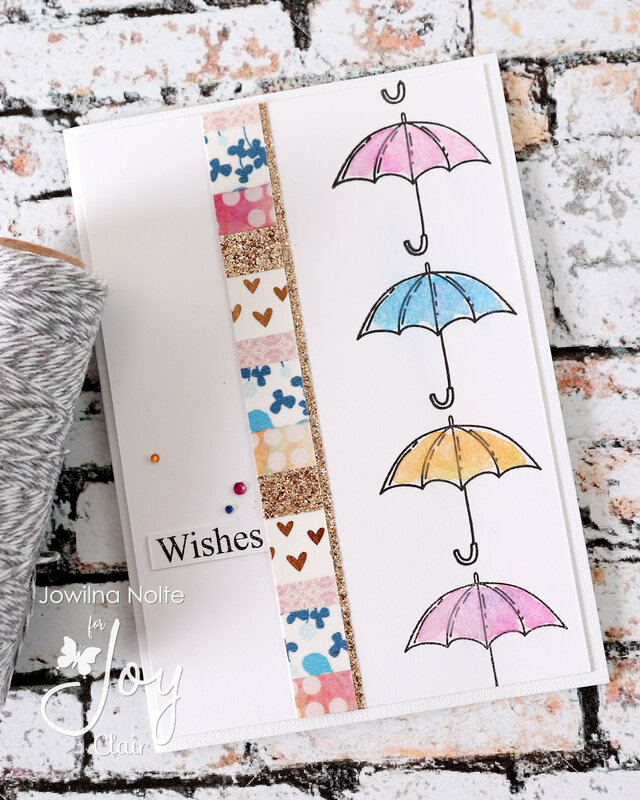 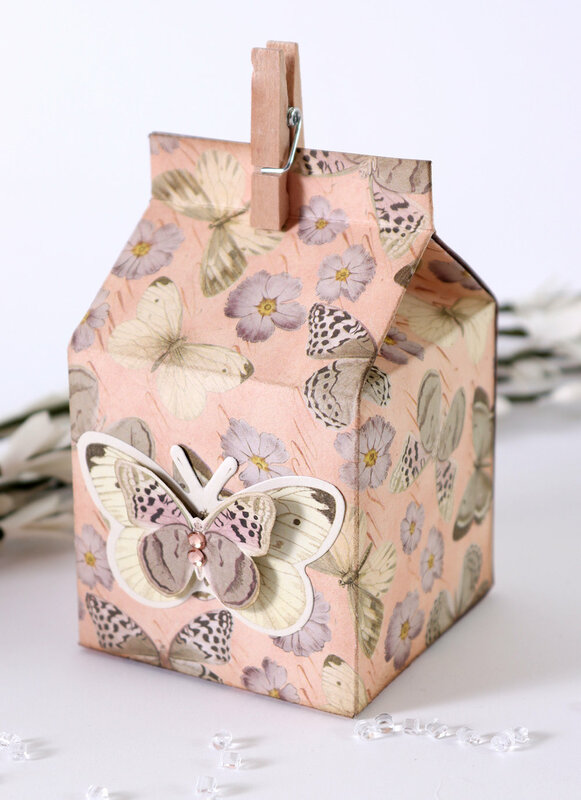 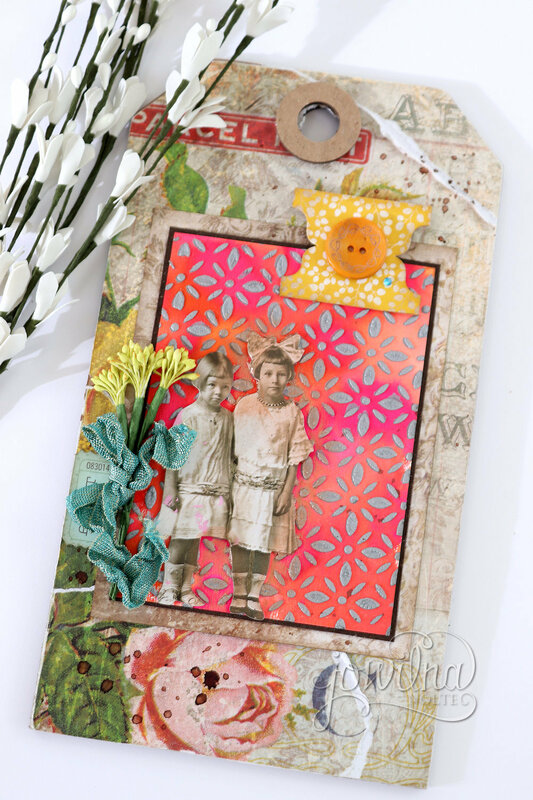 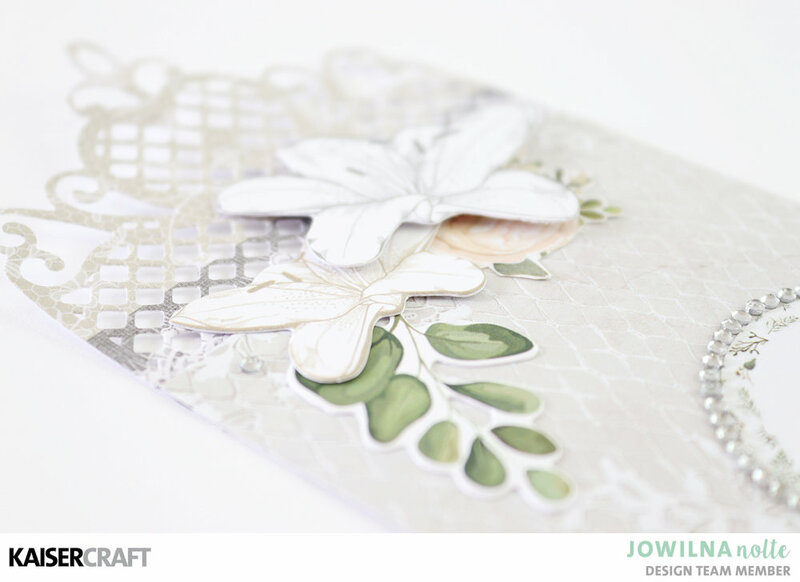 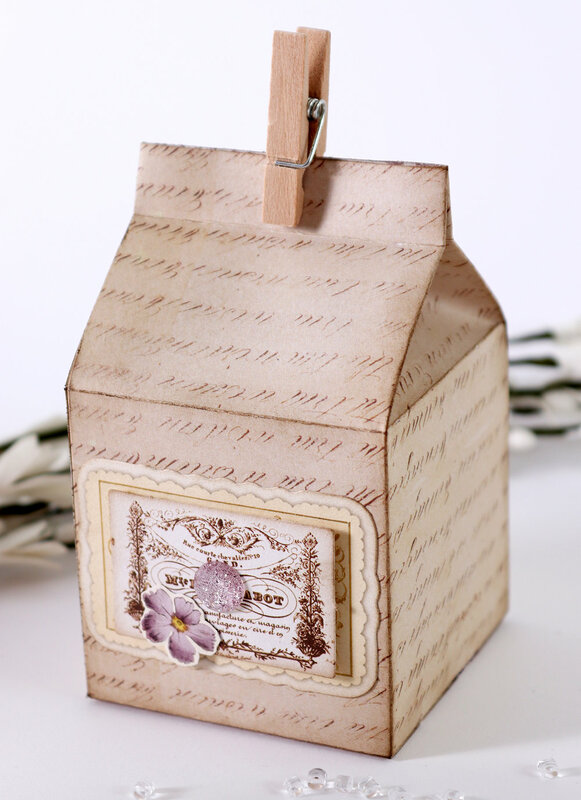 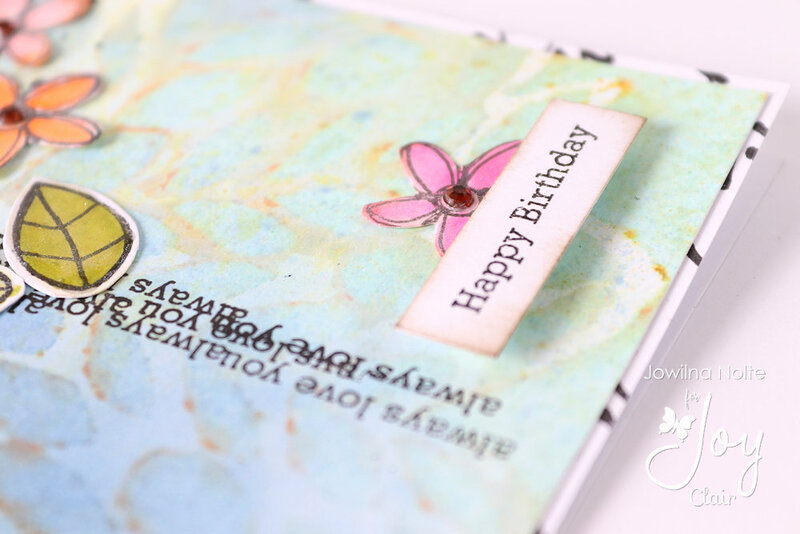 How to combine stamps to make a card and tag set with Joy Clair. 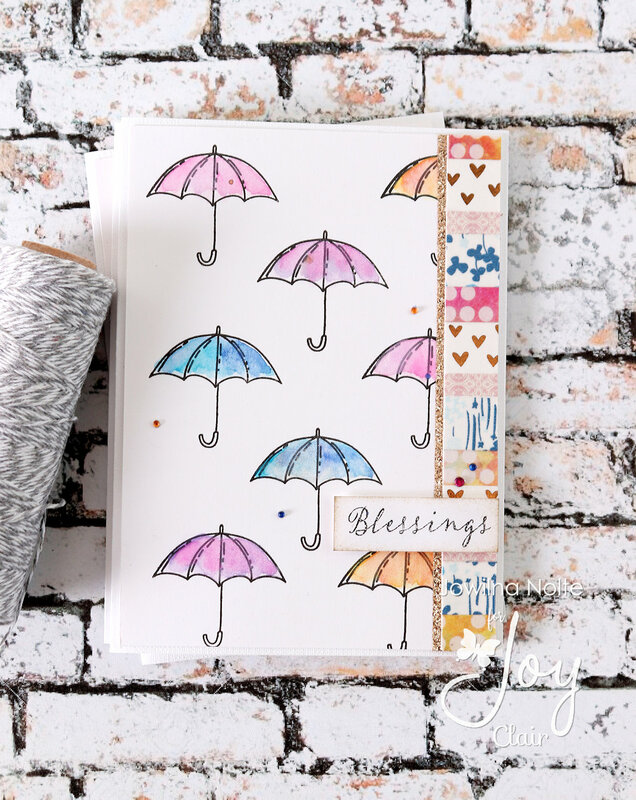 For my card I used God’s Promises and Rise and Shine stamp sets together. 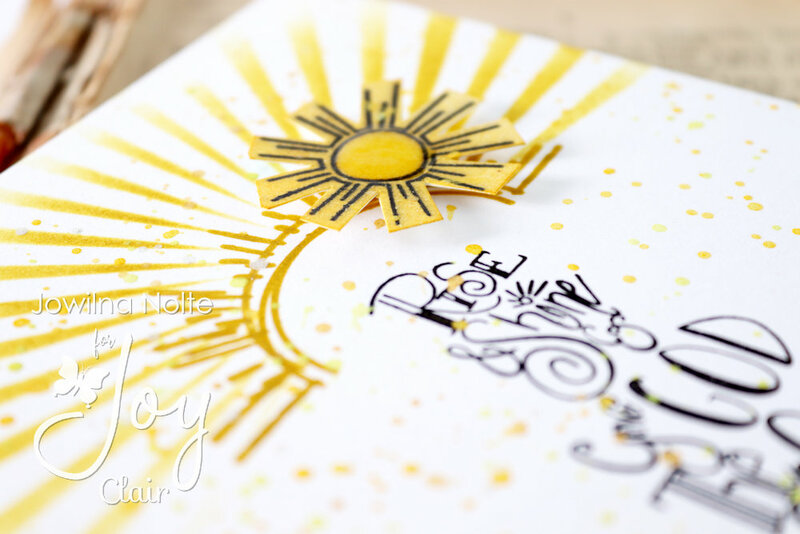 I started off by stamping the sun from the Rise and Sine set first repeatedly in yellow ink. 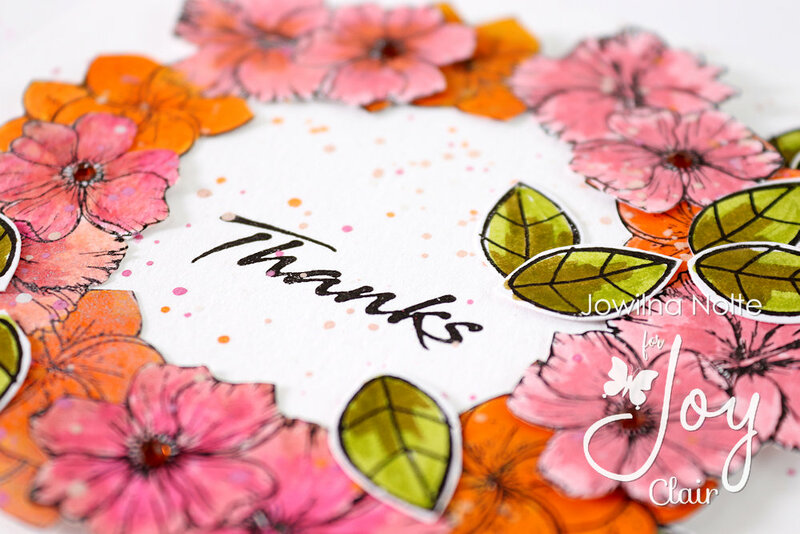 I then stenciled my sunshine stencil over the top edge of the card using the same yellow inks. 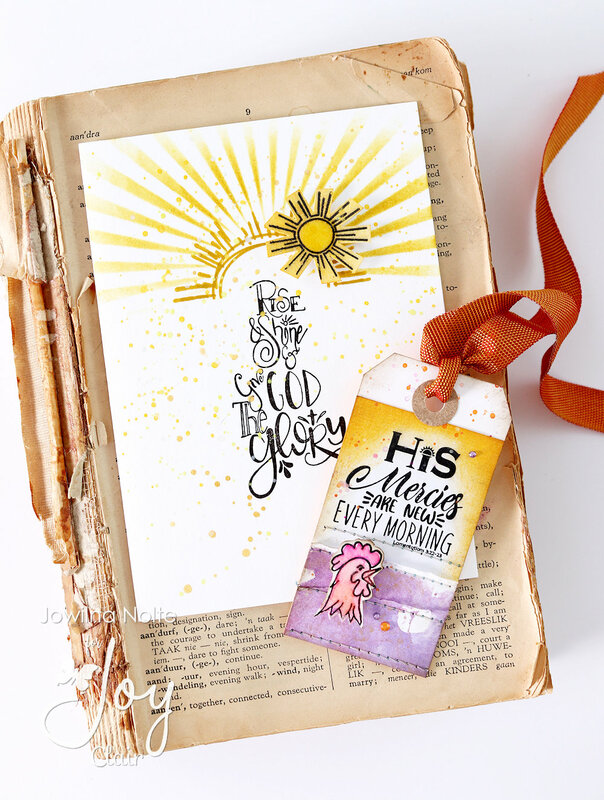 Stamped the sentiment in black VersaFine Clair ink below the sun rising, and then added the small sun from God’s Promises stamps set. 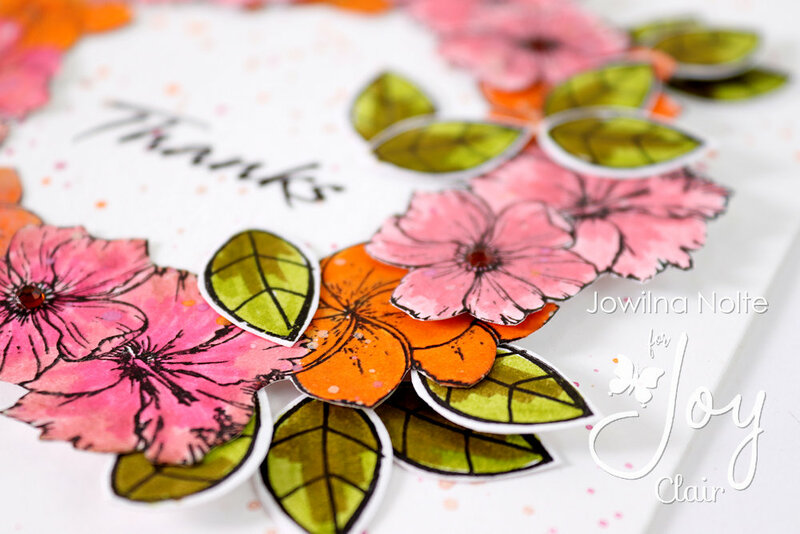 I stamped the small sun onto white cardstock, blended over it to add colour and then cut it out. 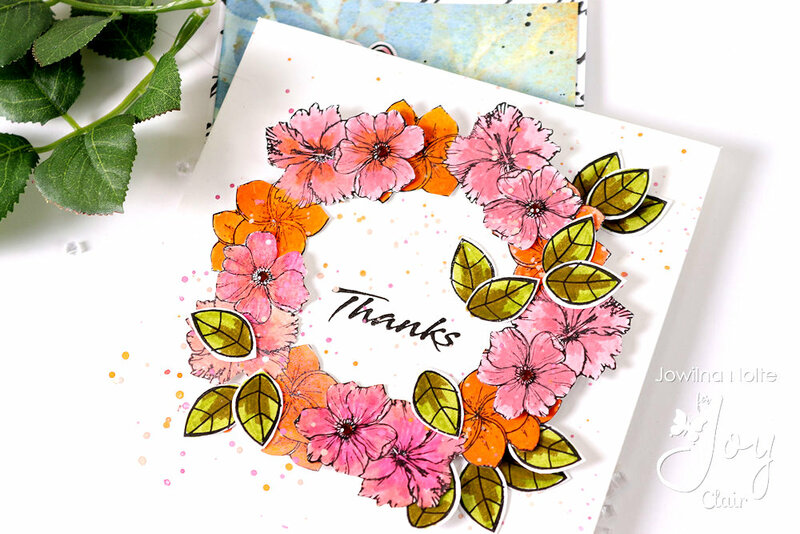 It was raise using foam tape and the center of the sun glazed with dimensional glaze. 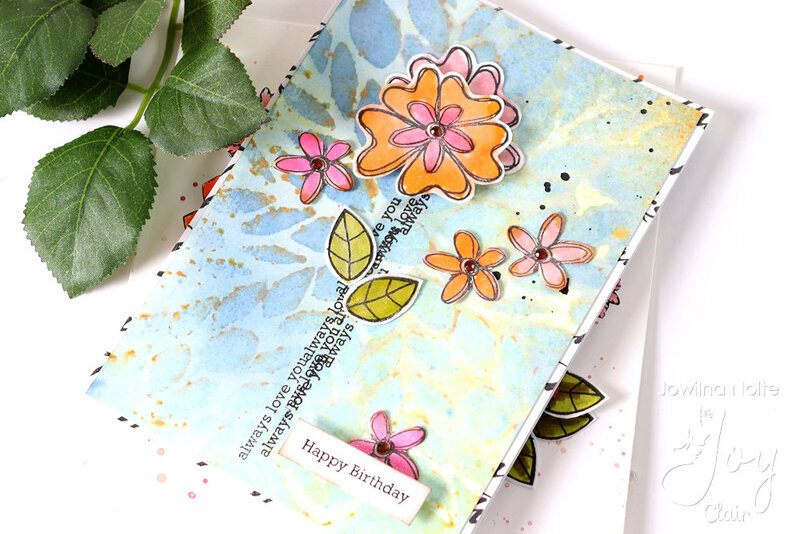 All of these yellow suns are sure to bring some sunshine into someone’s day with this quick and easy card. 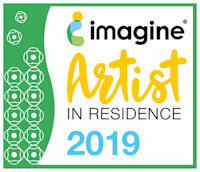 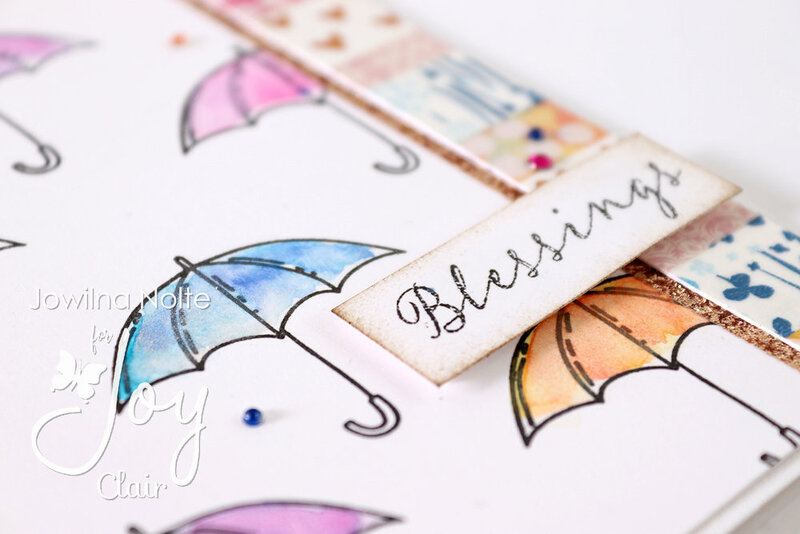 I also created this tag using the Rise and Shine stamp set. 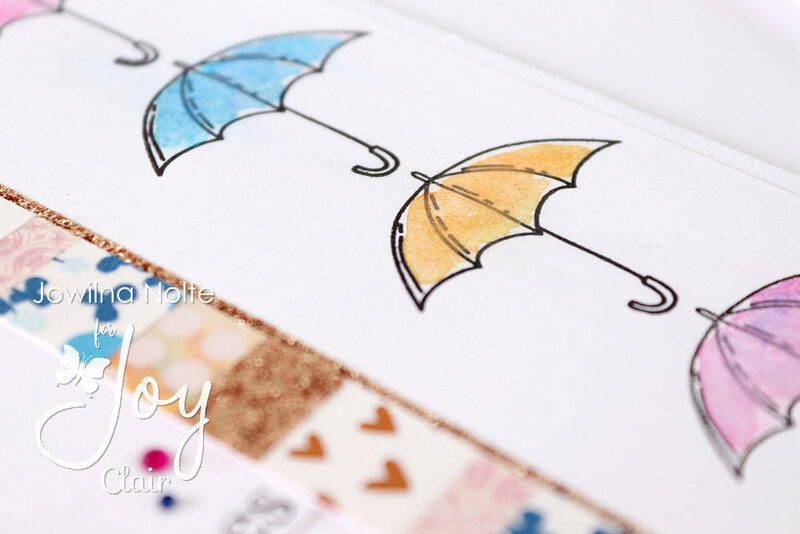 I stamped the sentiment onto a scrap piece of white cardstock and inked the edges around the side only using yellow ink. 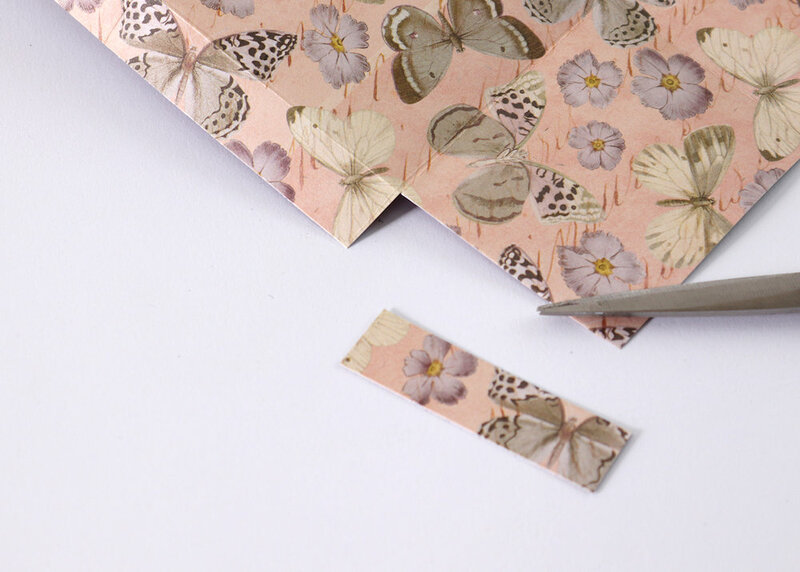 Some torn experimental pieces of paper using spray inks were sewn at the bottom of the tag in layers. 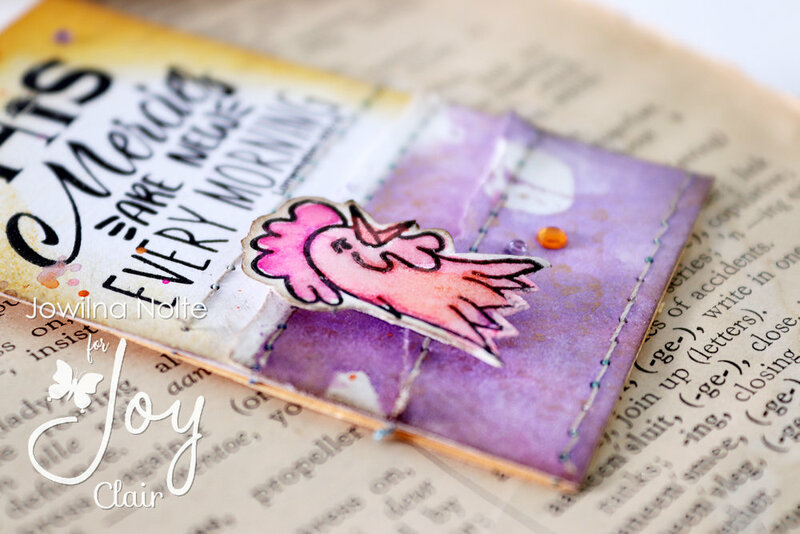 I used the rooster image stamped and painted for another project, but it turns out that I didn’t use it and so the head was chopped off and recycled for this tag. 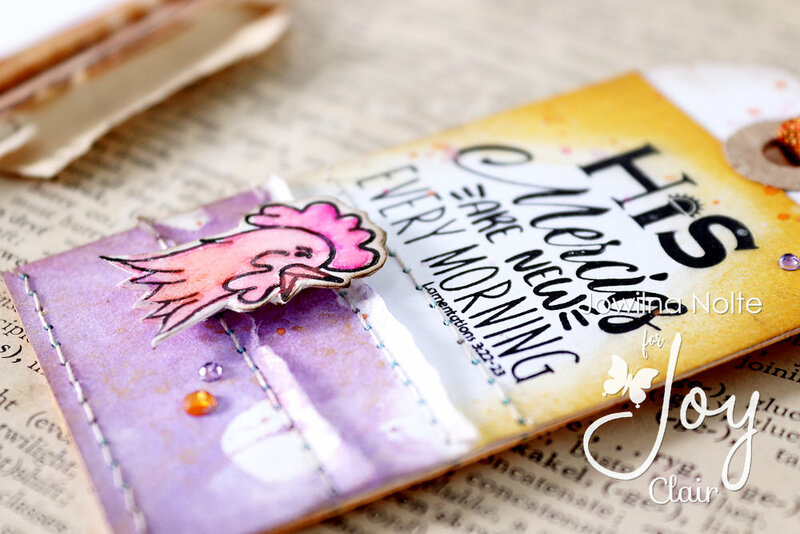 I like how the rooster looks like he is shouting the sentiment from the rooftops. 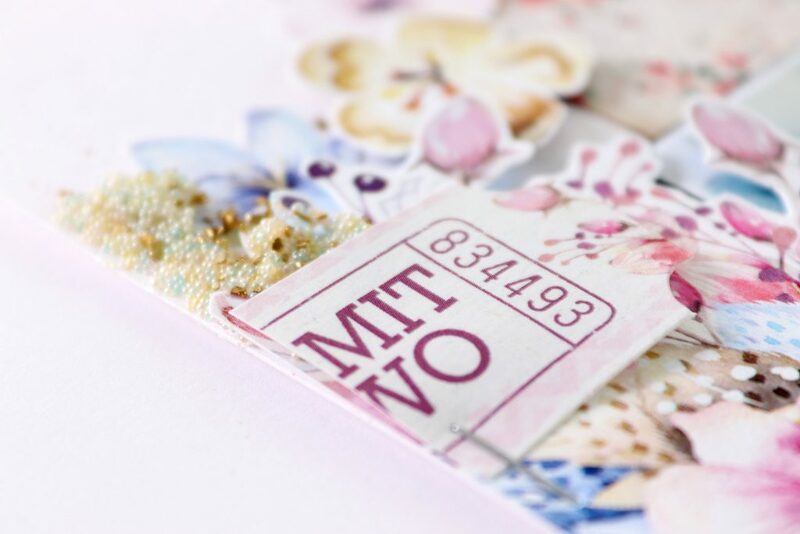 Remember to add some diamante and embellishments to further dress up your tag and add interest.